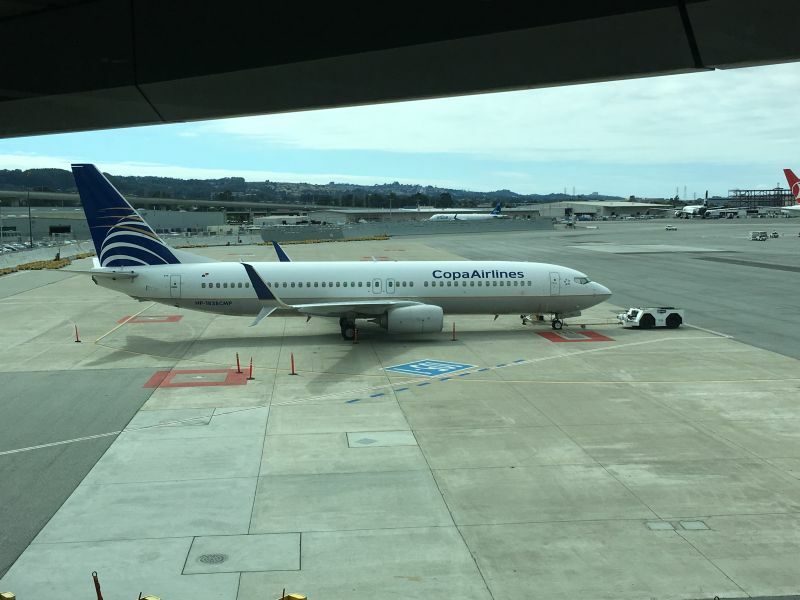 COPA Airlines is the national airline of Panama. 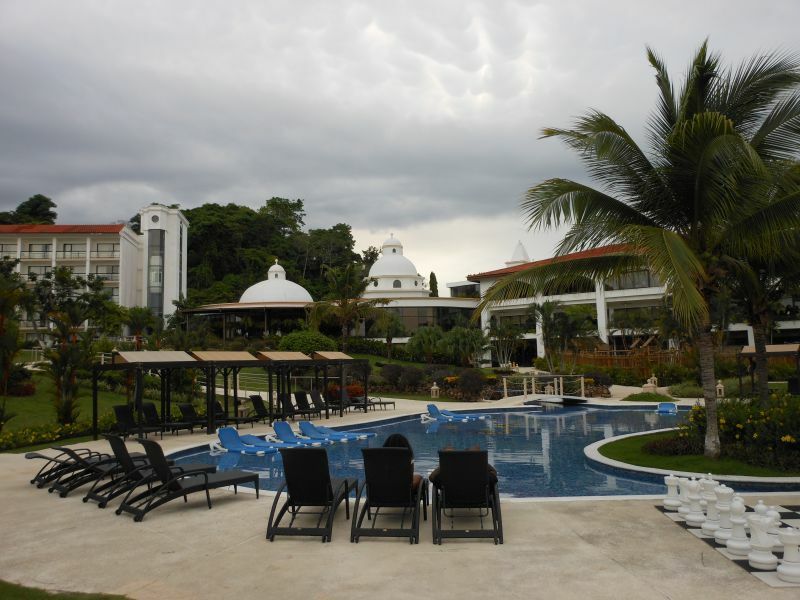 They offer direct service from SFO to PTY (Panama City-Tocumen International Airport). We decided to take them since it was a non-stop flight. We enjoyed some snacks and beverages in the United Club at Terminal G at SFO before we boarded our flight to Panama City. 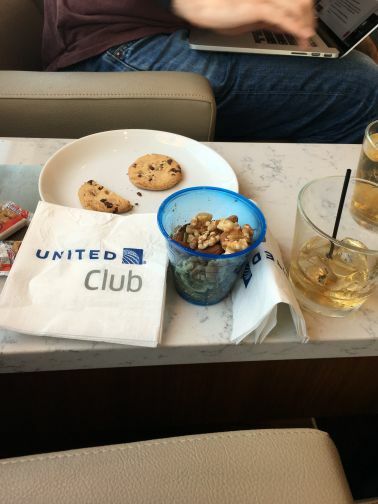 I was a little buzzed from the drinks, and I thought the guy next to me was eating my cookies. LOL. It turned out it to be Joy who was the "cookie monster thief." 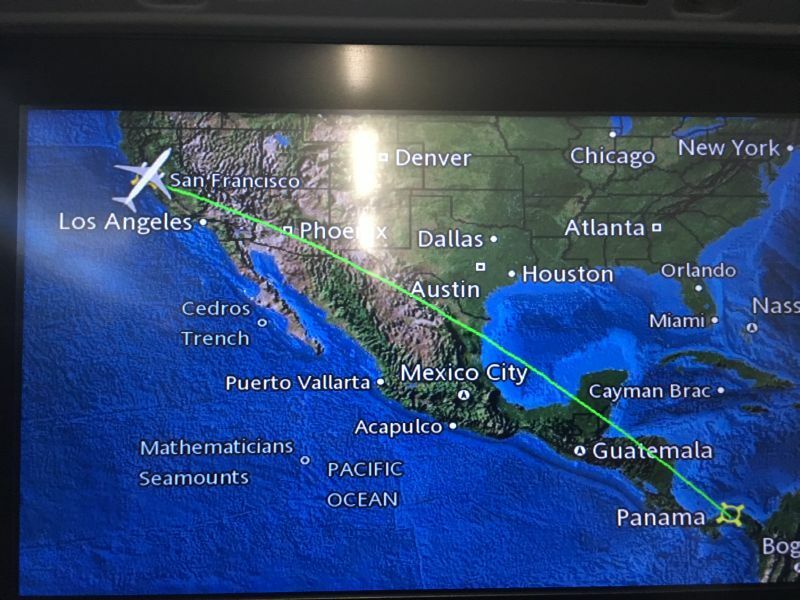 Our flight path took us over land mostly. I think it could be because COPA uses 737-800. I am not sure about their maximum ETOPs rating. 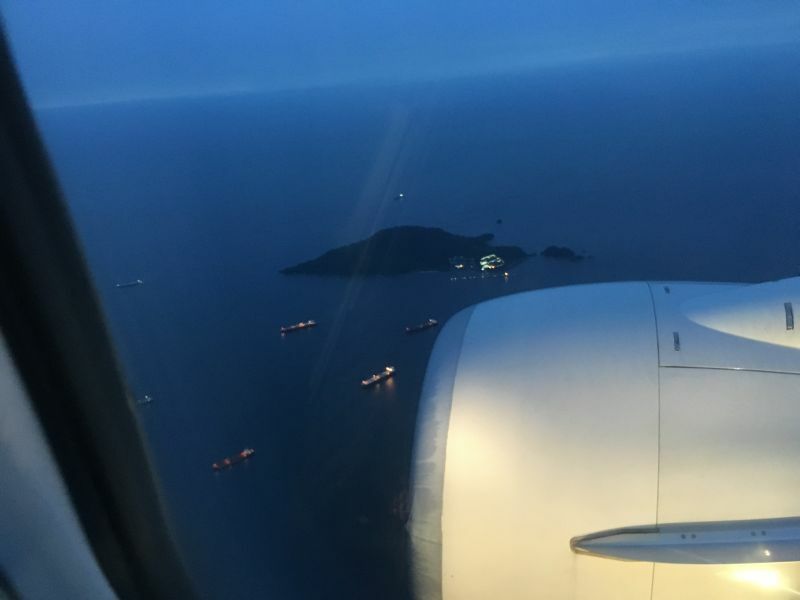 One can see the ships lining up for the Panama Canal as we were landing in Panama. 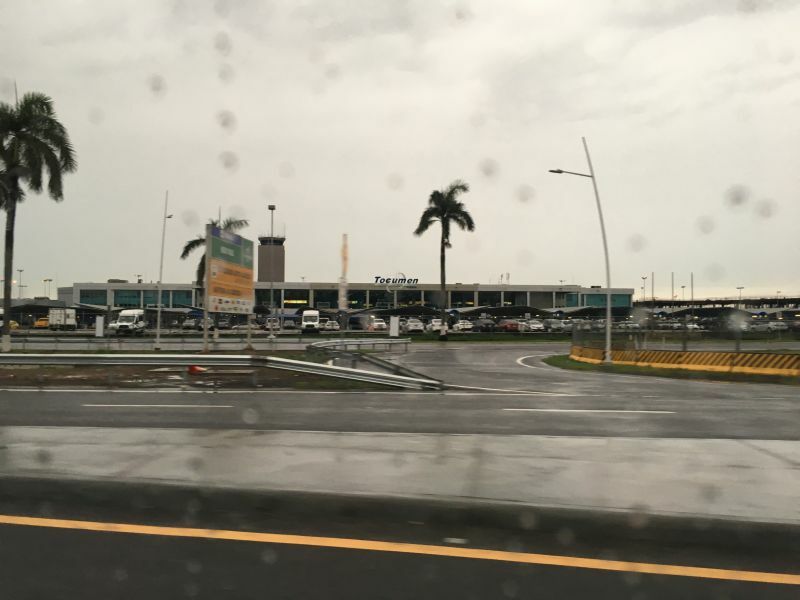 We had a private airport service transfer from Tocumen International Airport to our hotel in Panama City. 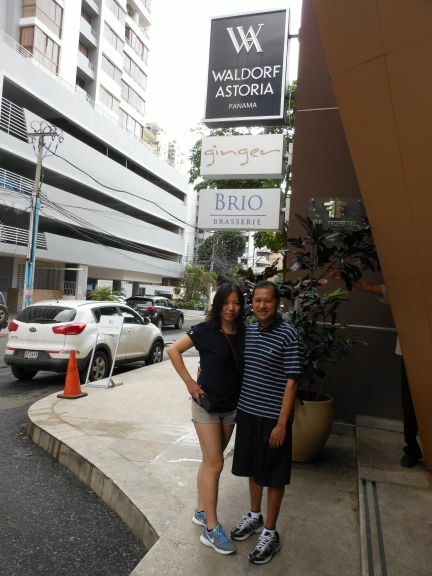 We stayed at the Waldorf Astoria Panama which is the only Waldorf Astoria property in Latin America. Our suite was not yet ready around 8:00 AM when we arrived so they asked us to enjoy the buffet breakfast while they prepared the room. The omlette chef was a true master of his trade. LOL. The food was good. 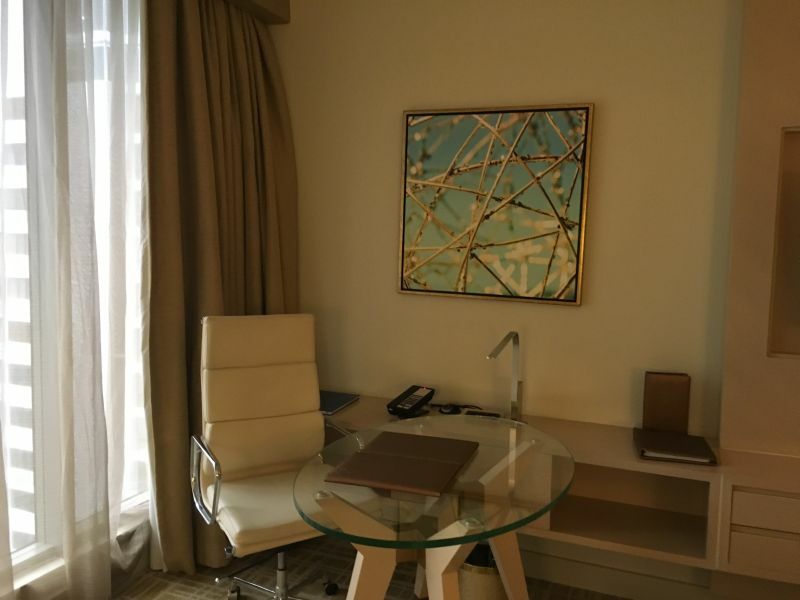 As a HHonors Diamond member, I was upgraded to a Junior Suite overlooking the city and ocean. 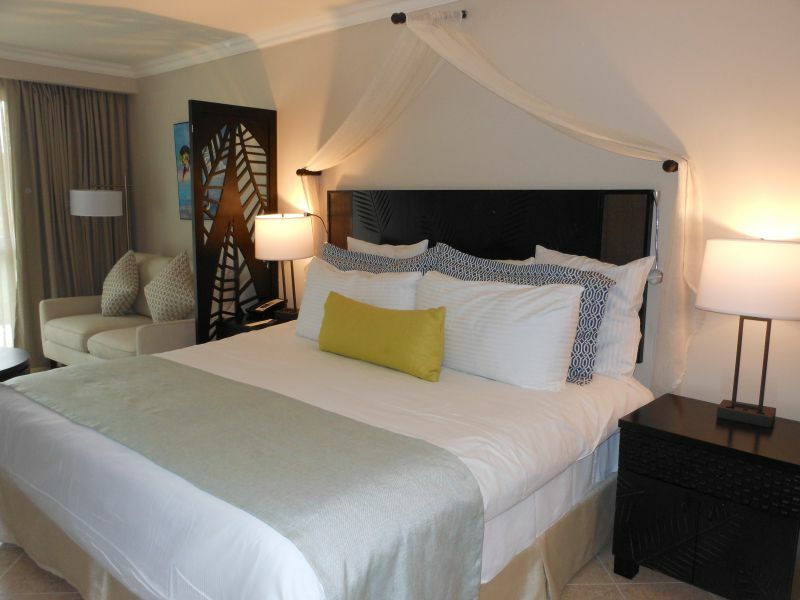 The suite was appointed well with nice furnishings as one would expect from a Waldorf Astoria property. This was the 2nd Waldorf Astoria property that I stayed at. The first one was in France. The bathroom was decent sized with a large soaking tub and a rain shower as well. This was the view from our suite. 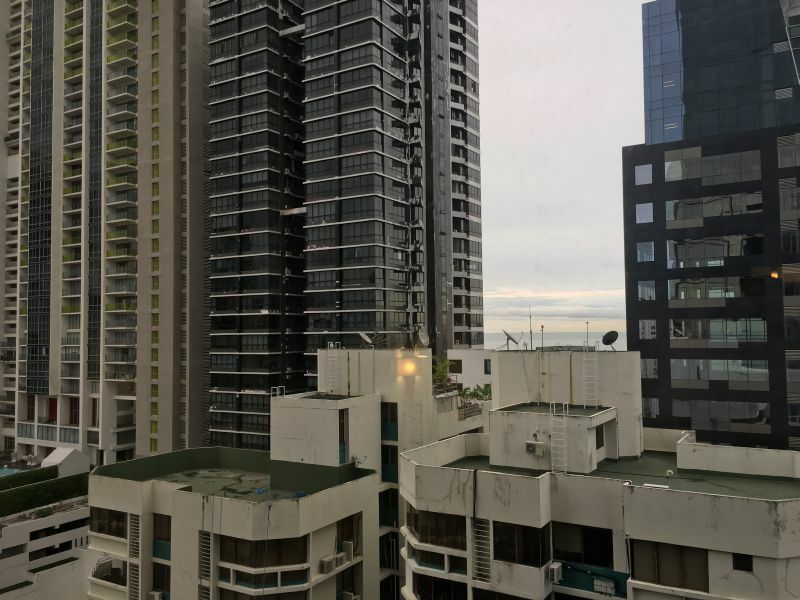 The ocean is behind these buildings. We took the Waldorf Astoria's Lincoln Town Car service to the Multicentro Mall where our Hop On, Hop Off Bus departed from. Since our tour did not depart until 1:00, we took some time to enjoy a beverage at the Red Lion Pub at the mall. I could not resist an ice cream cone too since it was so hot and humid out. 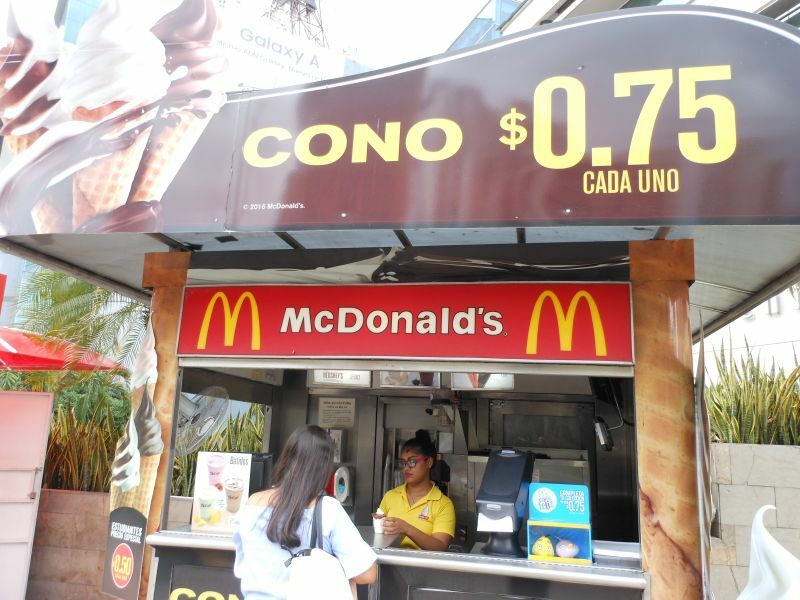 They had a McDonalds ice cream kiosk outside the mall too. 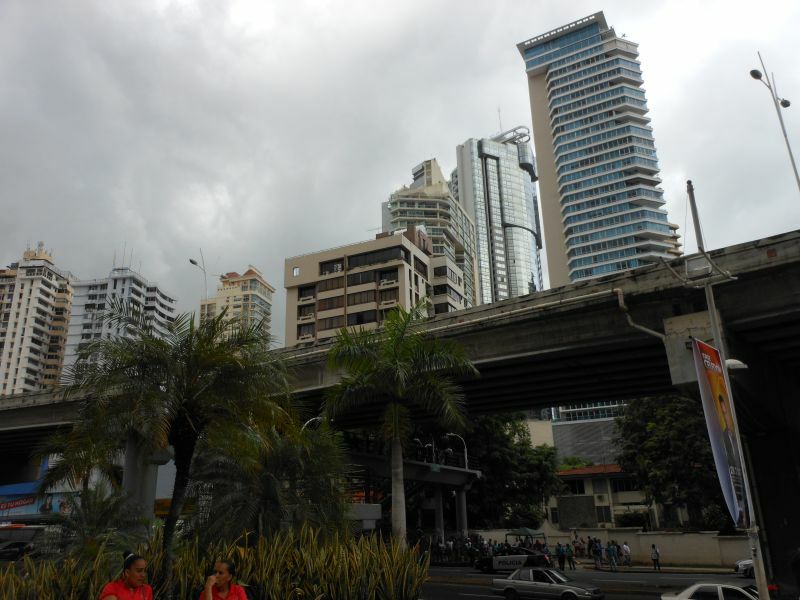 Panama City was full of skycrapers. 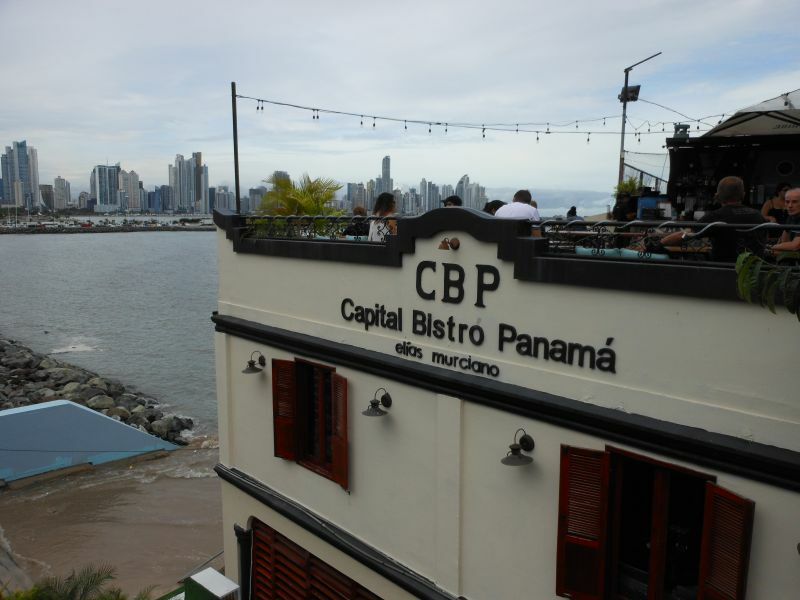 Panama City has the third most skycrapers in the Americas after New York and Chicago. 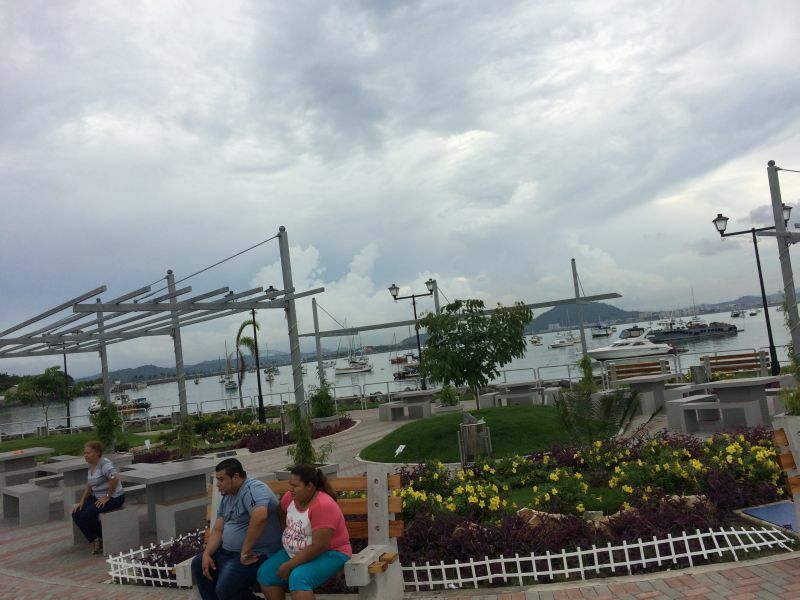 We went to the Panama Canal Visitor's Center at the Miraflores Locks on the Hop On, Hop Off Bus Tour. We could see the Miraflores Locks from the Visitor's Center. The locks were pretty cool to check out from the top of the building. 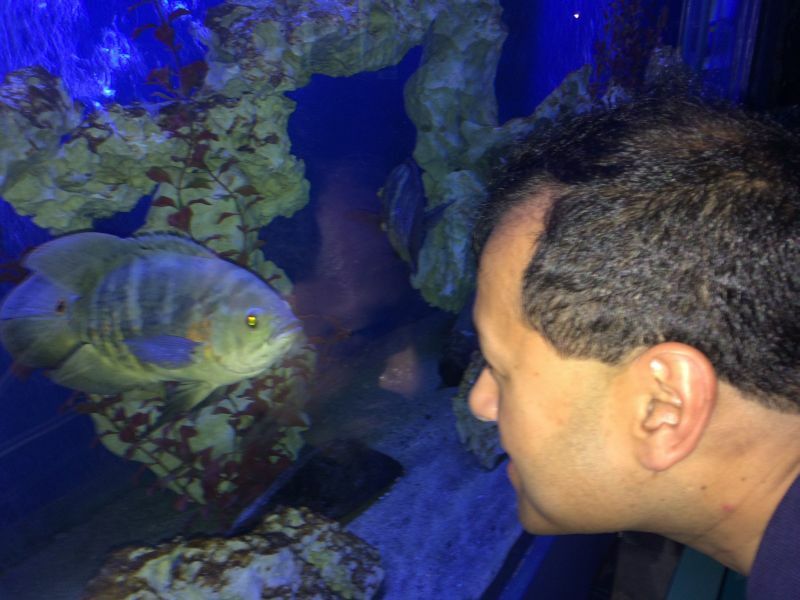 I had a staredown with a fish at the aquarium too. We saw a "chicken bus" while going through the ghetto areas of town. The "chicken buses" are old US school buses turned into public transportation buses with art work painted on them. They are supposed to be dangerous to ride however. This is a ghetto area of town. We drove through the Amador Causeway on the Hop On, Hop Off Bus Tour which is a man made land bridge connecting three islands. The skyline views were amazing from there. 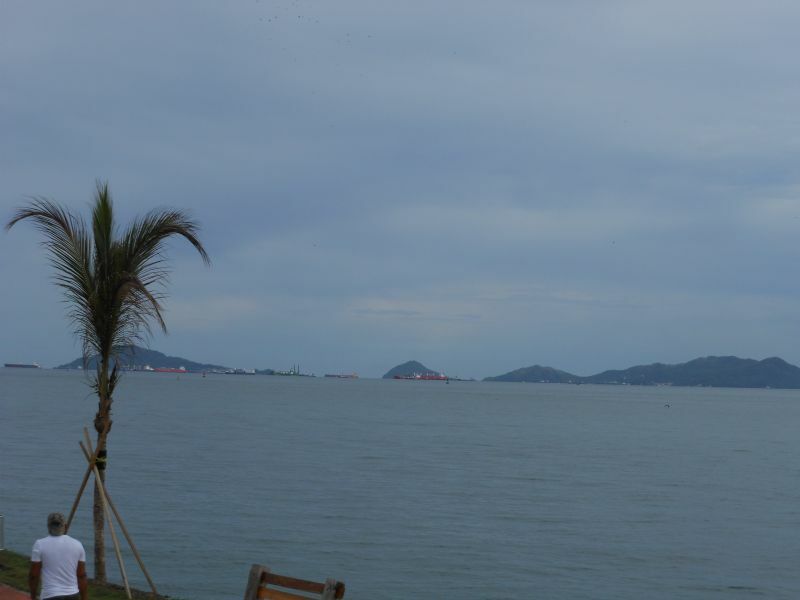 We could also see the ships lining up for the Panama Canal on the other side of the Amador Causeway. We got off the tour bus at Casa Antigua, which is the "old town." Casa Antigua was built in 1673 after the pirate Henry Morgan forced the burning of the original Spanish settlement near Panama City. 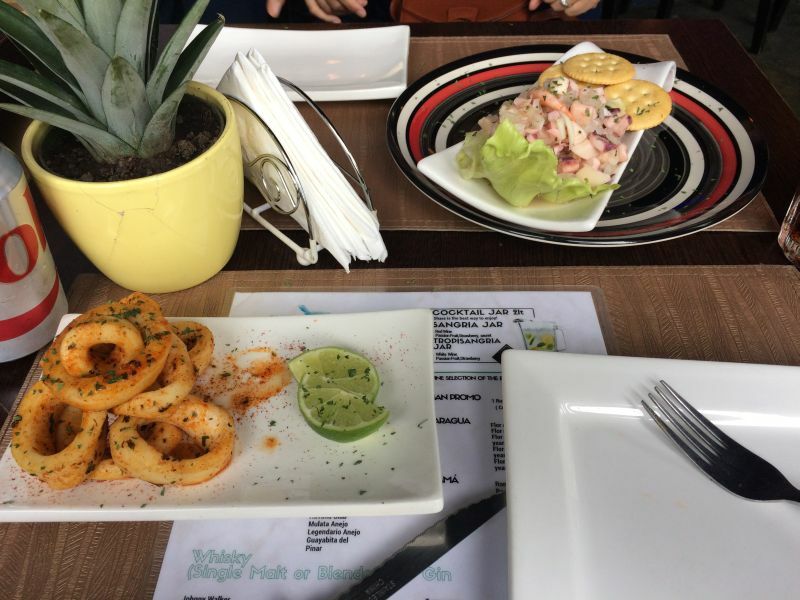 We had a late lunch that consisted of ceviche and grilled calamari at the Picasso Cafe in Casa Antigua. Ceviche is the national dish of Panama. Casa Antigua is an UNESCO World Heritage Site. 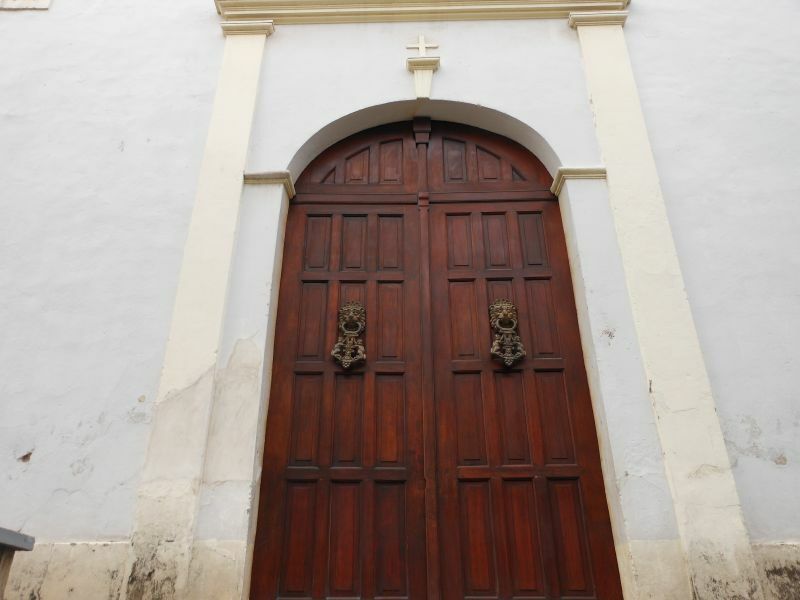 Here are some doors to a really old church. The American Trade Hotel is in the background. Our Taste of Panama Tour started here at the Unido Coffee Roasters Coffee Shop. Our first stop on the tasting tour was the coffee shop where they brew the world's most expensive coffee, the Geisha Coffee Bean. This cup of coffee costs $8, but it is $50 in Tokyo. Our guide paired it with organic Panamanian chocolate too! 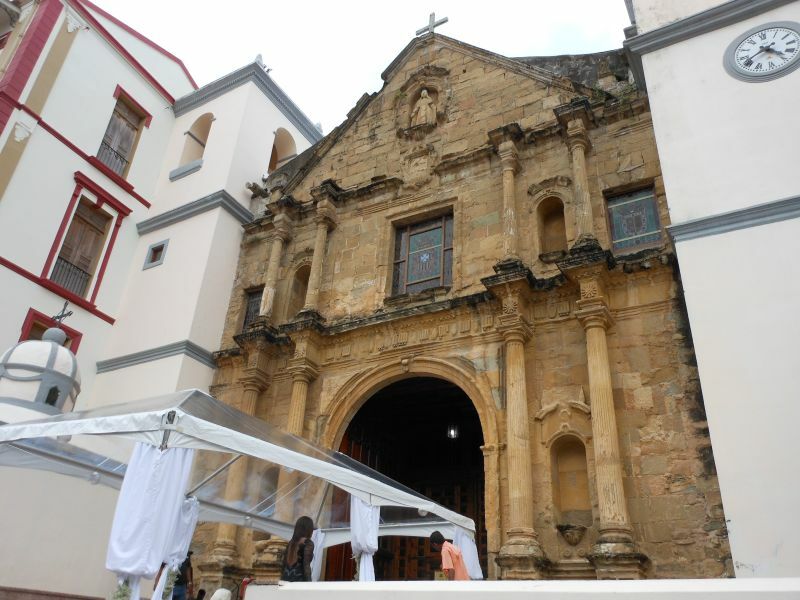 We went by Panama's oldest church after the coffee tasting. It is also in Casa Antigua. Our guide was American, and he told us about Casa Antigua. It was a bad area until recently when they revived it from a wasteland of gang violence. We went to a brewery next. 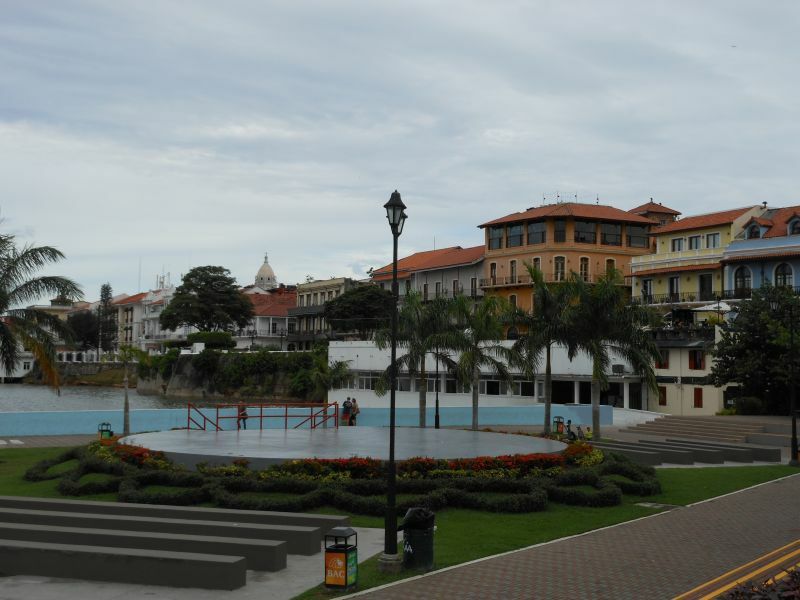 The La Rana Dorado Brewery is regarded as the best brewery in Panama. The beer was pretty darn good! 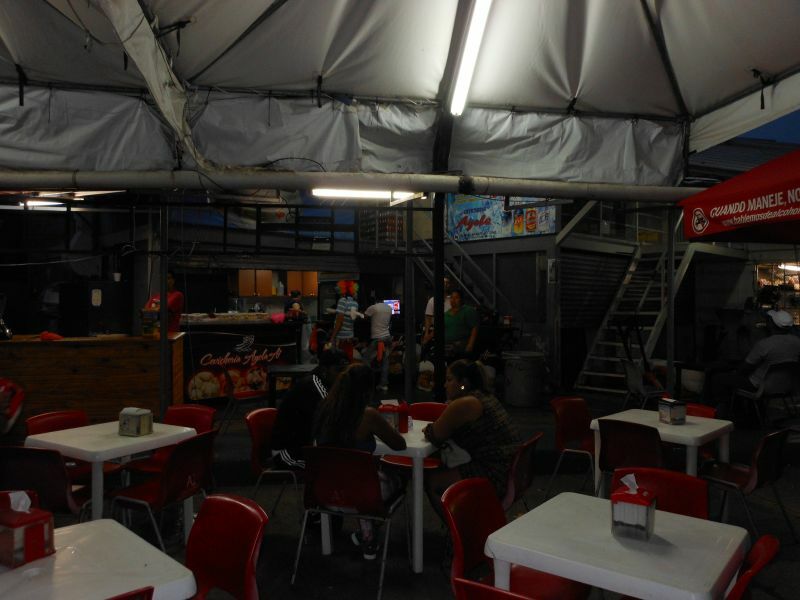 This is the famous seafood market in Panama City where Anthony Bourdain visited during the filming of his show. 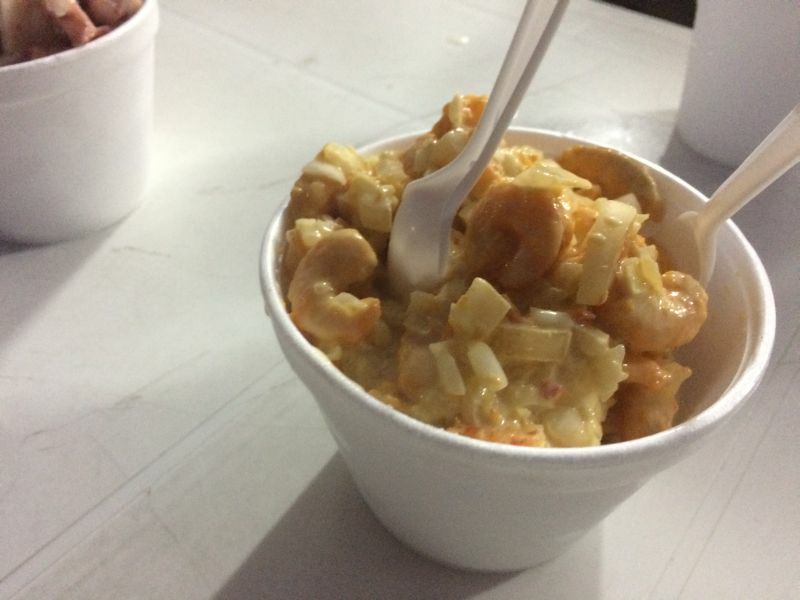 The seafood market is famous for their ceviche. Our final stop on the tasting tour was the roof top bar at Tantalo. 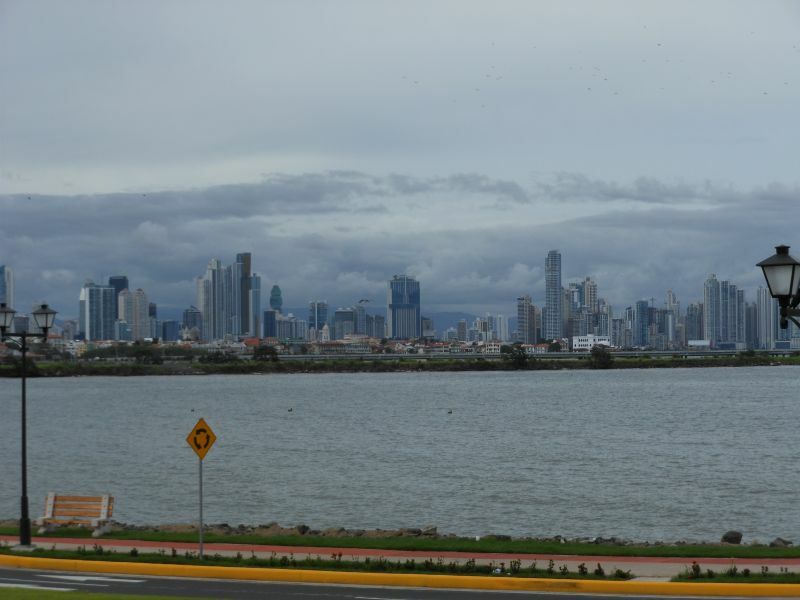 We had amazing views of Panama City from there. 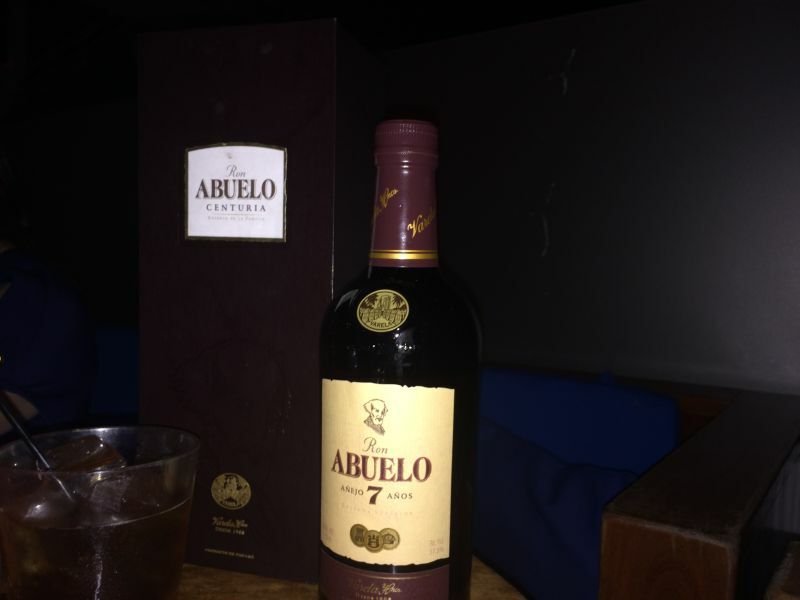 We tried 7 year Ron Abuelo Rum. This rum is made by a company owned by the current president of Panama. We met a cool couple from California on our food tour who invited us to join them for some fish tacos at this cool outdoor restaurant in Casa Antigua. The fish tacos were tuna and so amazing! 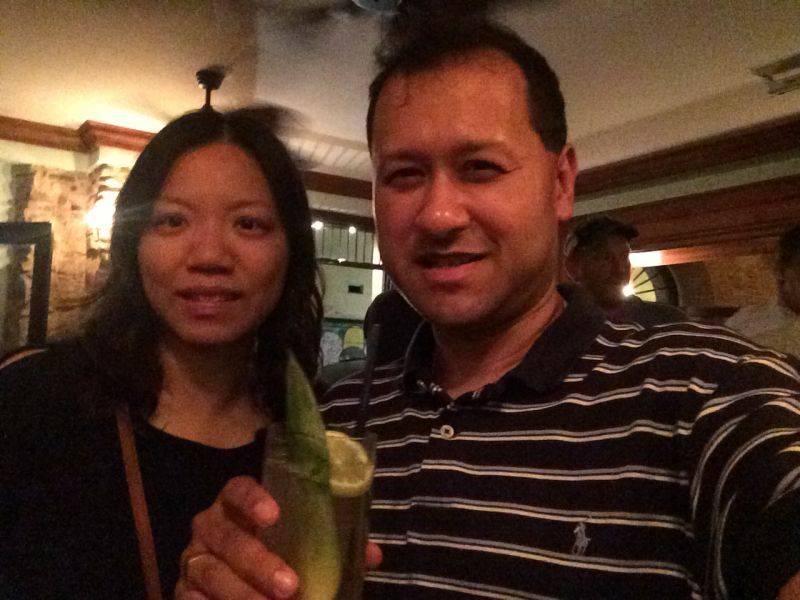 We went to a rum bar with the couple we met on our tour also. The Pedro Mandinga Rum Bar had really good rum drinks! 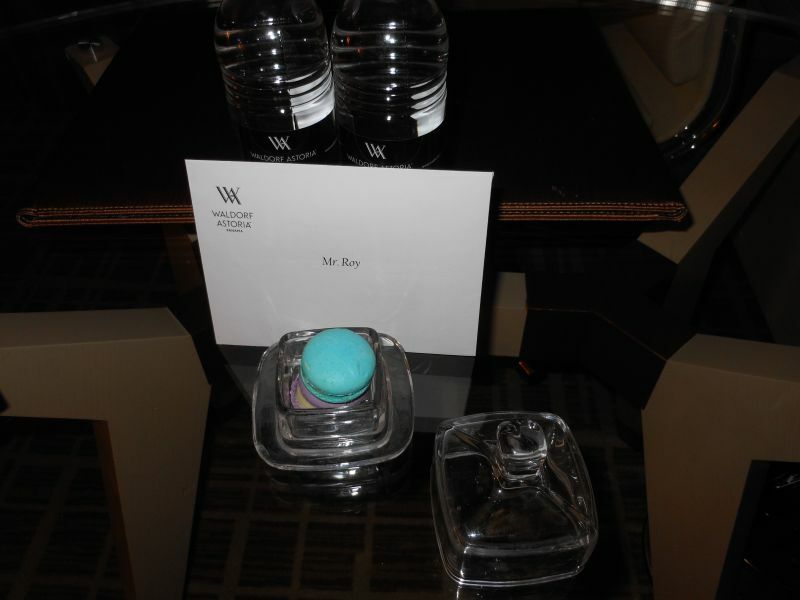 After returning to the Waldorf Astoria via Uber, we found these amazing macaroons waiting for us in the suite compliments of the hotel. 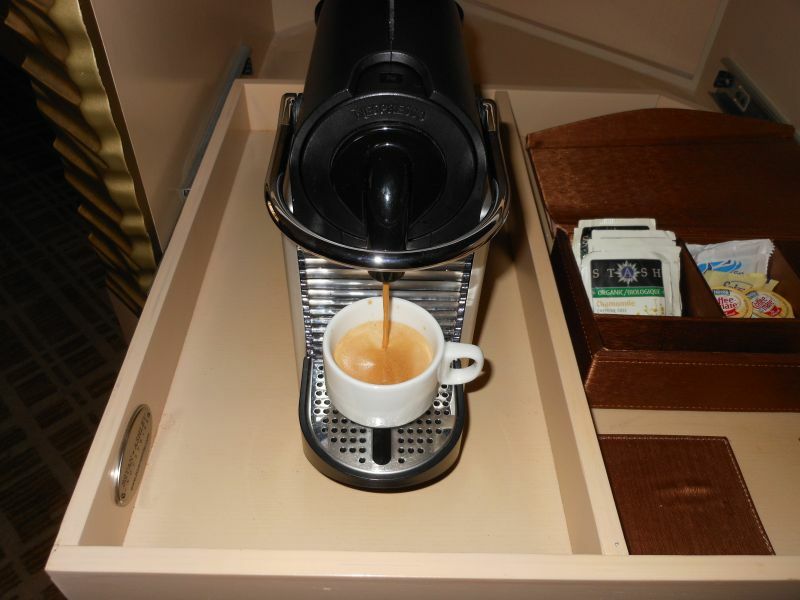 I loved the Nespresso Machine in our suite at the Waldorf Astoria. 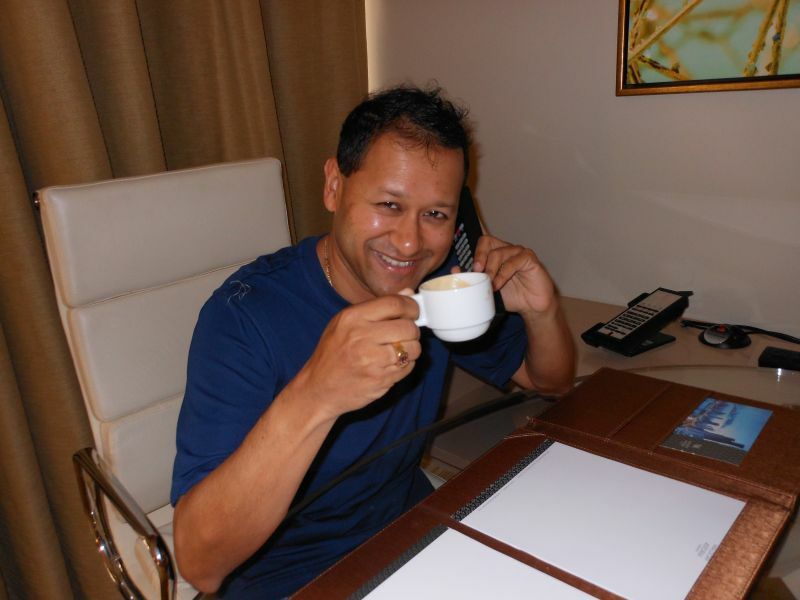 I am enjoying my Nespresso in the suite. The pool deck at the Waldorf Astoria was really cool. After checking out of the Waldorf Astoria, we headed over to the Dreams Delight Playa Bonita Resort. 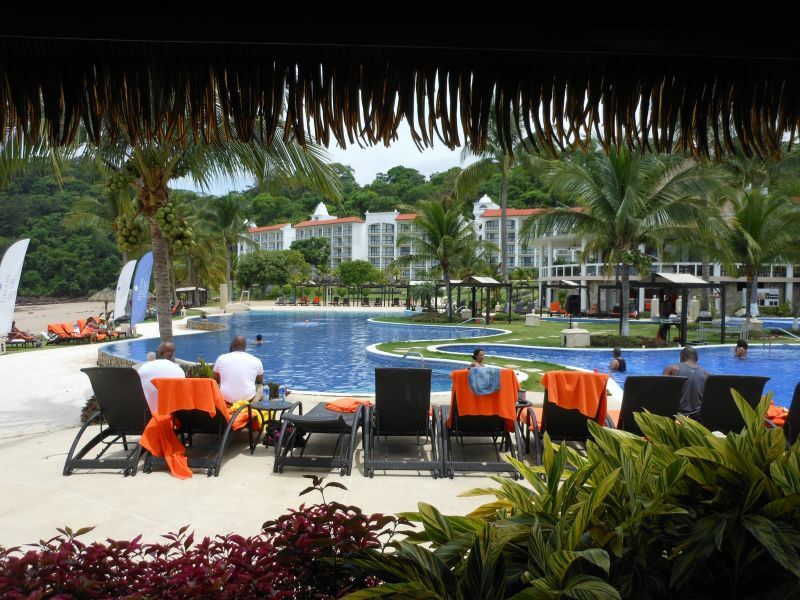 The all inclusive Dreams Delight Resort in Playa Bonita was right on the beach. The views were stunning. We had a champagne welcome as we checked into our room. I loved the canopy over the bed in the room. 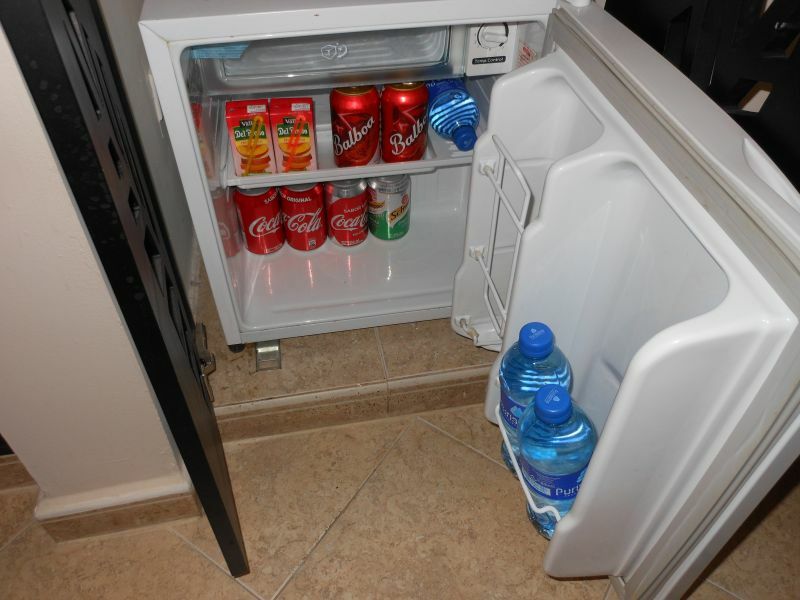 They stocked our little mini bar with soda, juices, water, and beer. It was all included too. This was during high tide on the beach. The Pacific was pretty warm down here in Panama. The water was not as clear as the Caribbean however. 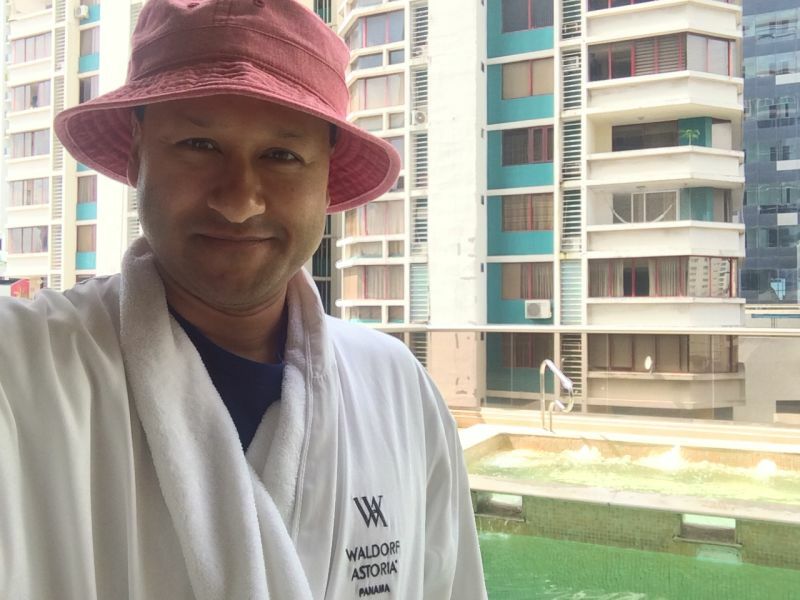 I took advantage of the all inclusive liquor as I danced and swam in the pool with the DJ music blasting in the background to create a perfect party atmosphere. 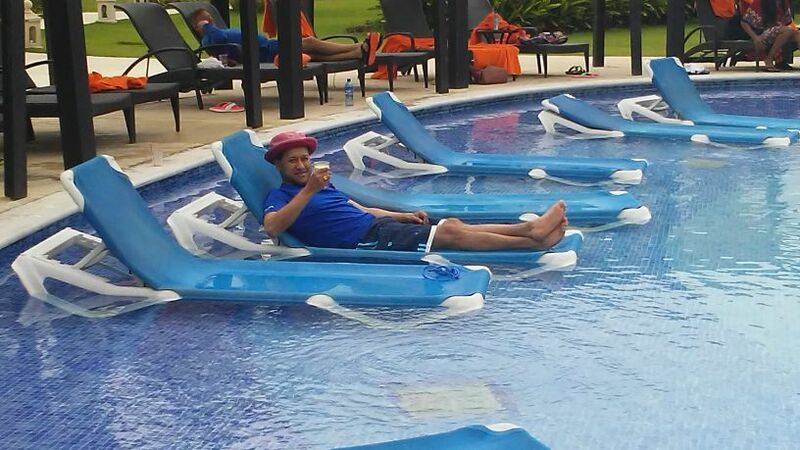 I also got a chance to chill on the floaters in the pool also. I think I was a little buzzed. LOL. 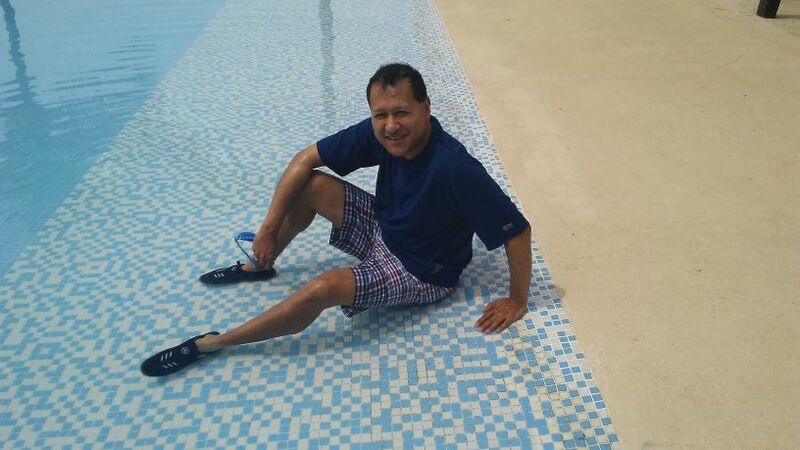 All I know is that I enjoyed myself a lot at the resort. 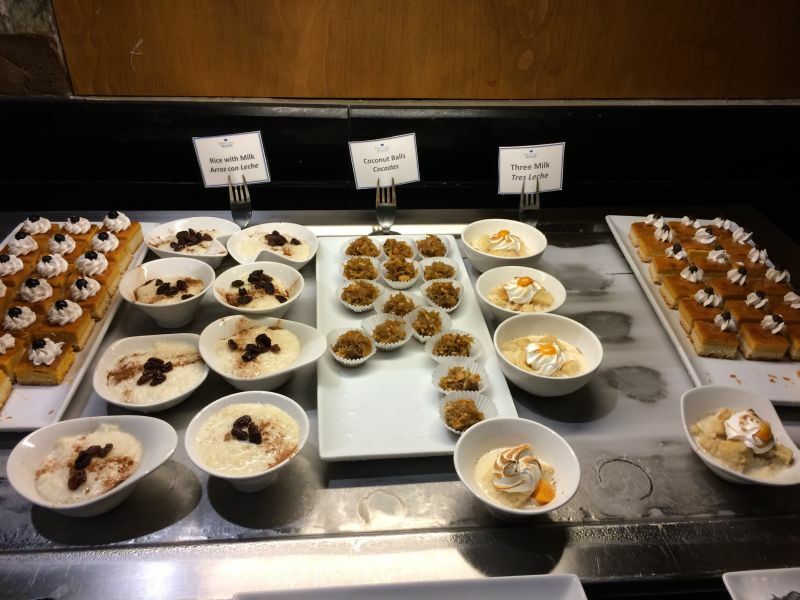 The Panamanian Dinner Buffet at the resort was pretty good. I liked these tamale like things. The desserts were great too! The lobby bar was a nice place to chill and enjoy more rum drinks into the evening hour. They also had a dance club that was open until 1:00 where we could take advantage of the all inclusive liquor too. This is a nice view of the resort from the outdoor restaurant where lunch is served. I enjoyed the pool too again in the morning. Joy and I rented bikes in the afternoon to tour the Amador Causeway area. 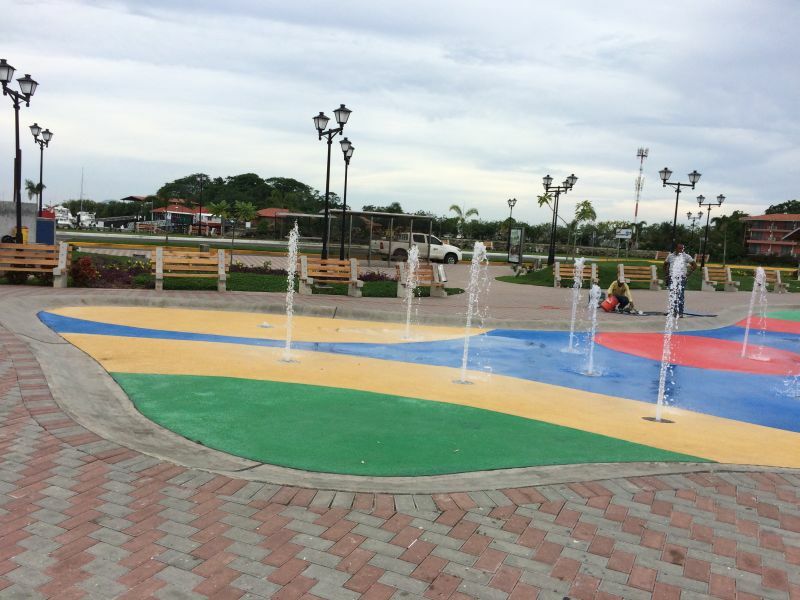 They had really nice parks all over the causeway area. Here is another shot of the park area on the causeway. 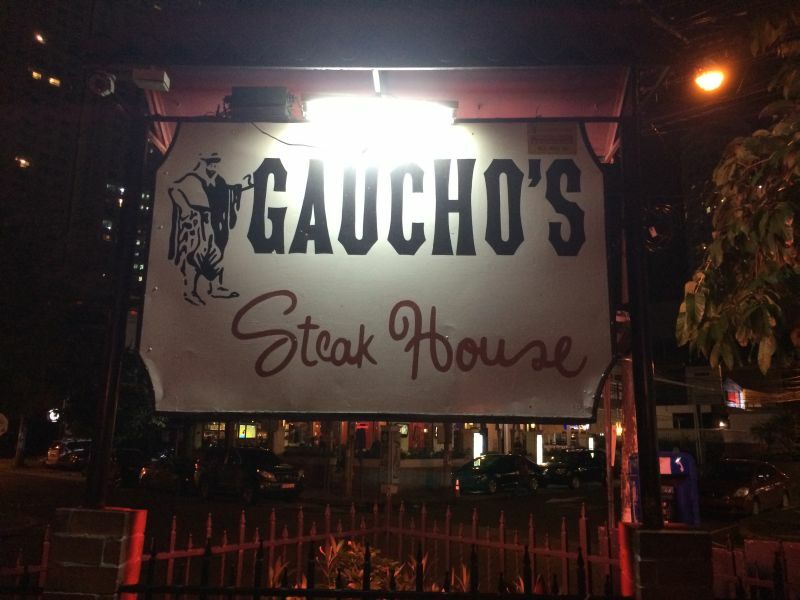 For dinner, the concierge recommended Gaucho's Steak House. It is an Argentine Steakhouse. They bring the cuts of beef to one's table too so one can make an informed decision on what to get. For my entree, I got a filet. 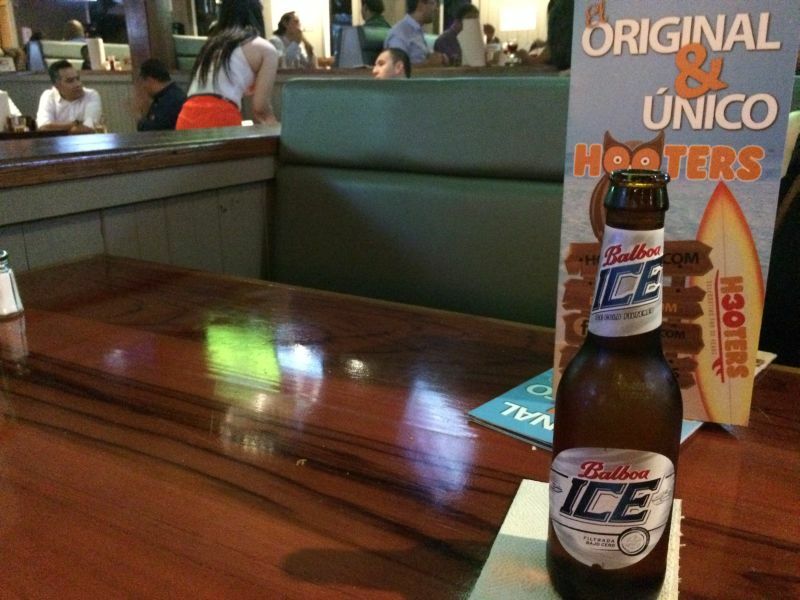 We went to Hooters after dinner for drinks. Joy is enjoying her beverage here. I enjoyed a Balboa Ice which is another local beer. 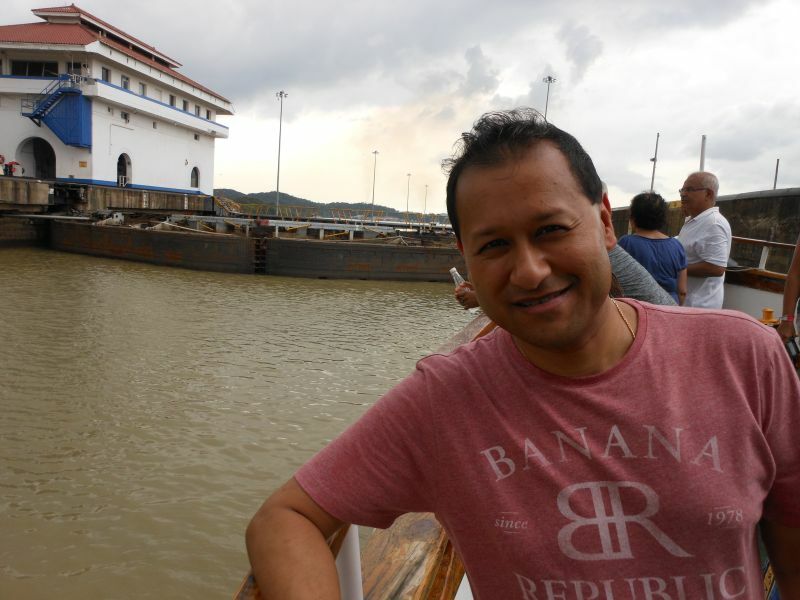 We went on a partial transit tour on the Panama Canal the next day. 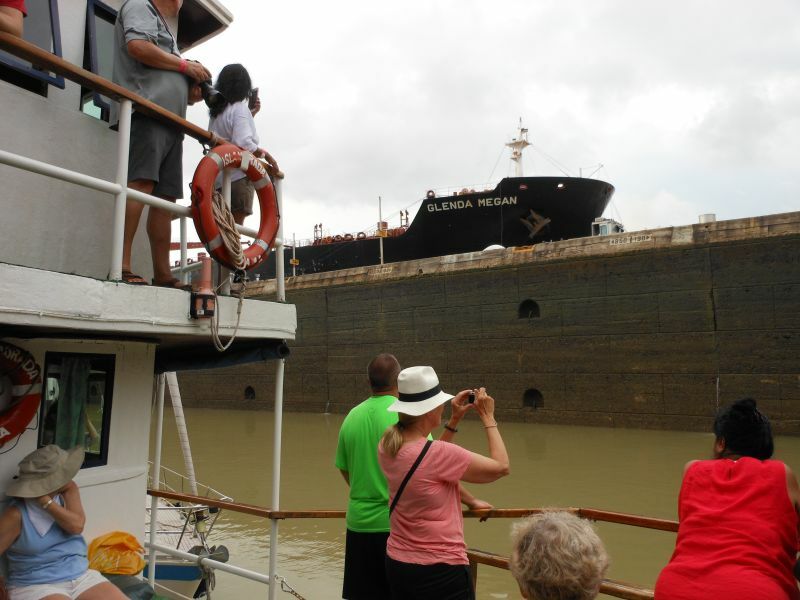 We boarded the Islamorada which is over 100 years old in the port of Gamboa near the middle of the canal. We made our way towards the Pacific through the Culebra cut. This was an area where they had to cut through a lot of rock and hills. The Centennial Bridge was built to mark the 100 year anniversary of the opening of the canal. 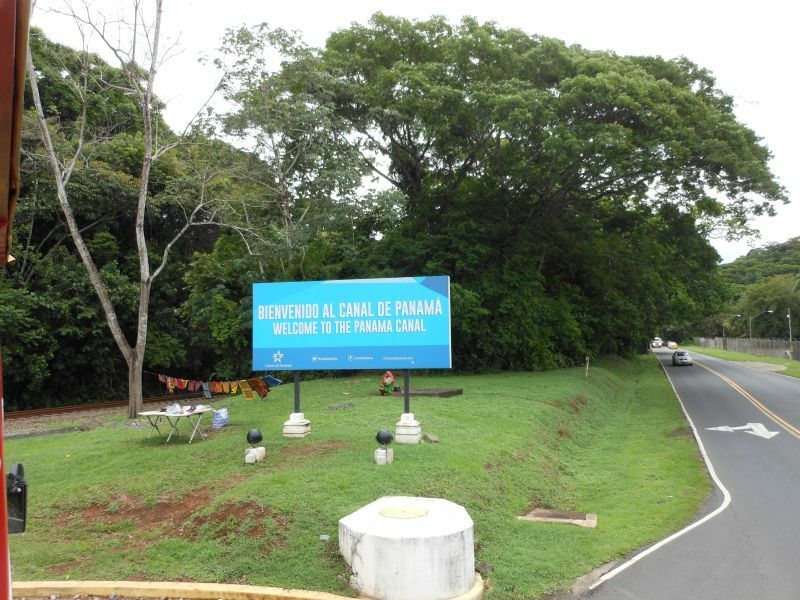 It is the 2nd bridge to cross the Panama Canal. This bridge is located near the Continental Divide. 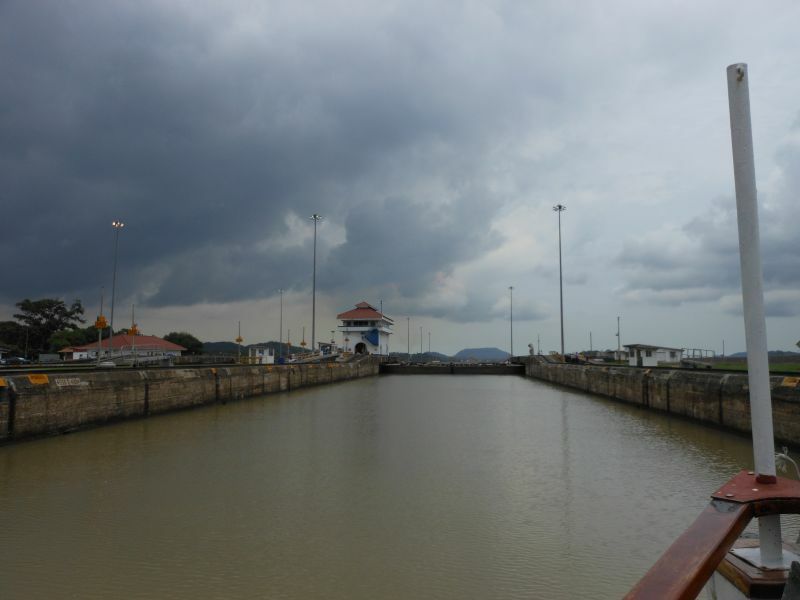 This is when we entered the first lock on our way to the Pacific which is called the Pedro Miguel Lock. The Pedro Miguel Lock is behind me. Here is a picture of the boat while we were in the lock. One can see how our boat was being lowered when the water was being let out of the lock. The ship above us is at the level we were at before the lock was draining. 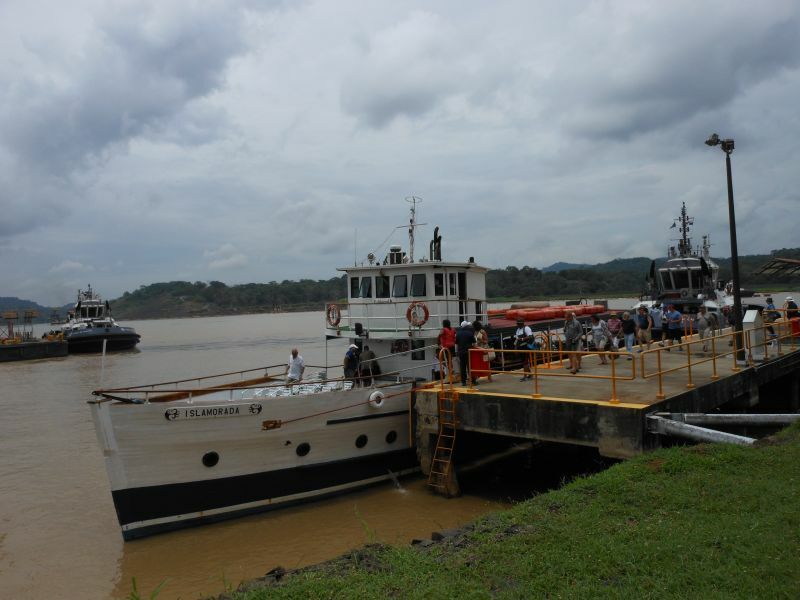 After the water level dropped enough, the first lock on the Miraflores Locks opened. 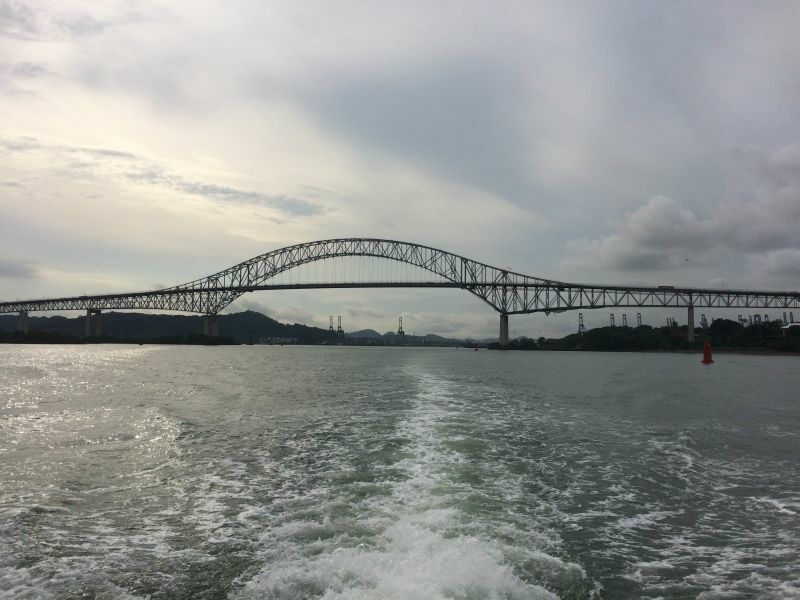 We exited the Panama Canal into the Pacific Ocean underneath the Bridge of the Americas. We had some time left at the airport before we departed for SFO so I did some duty free shopping. 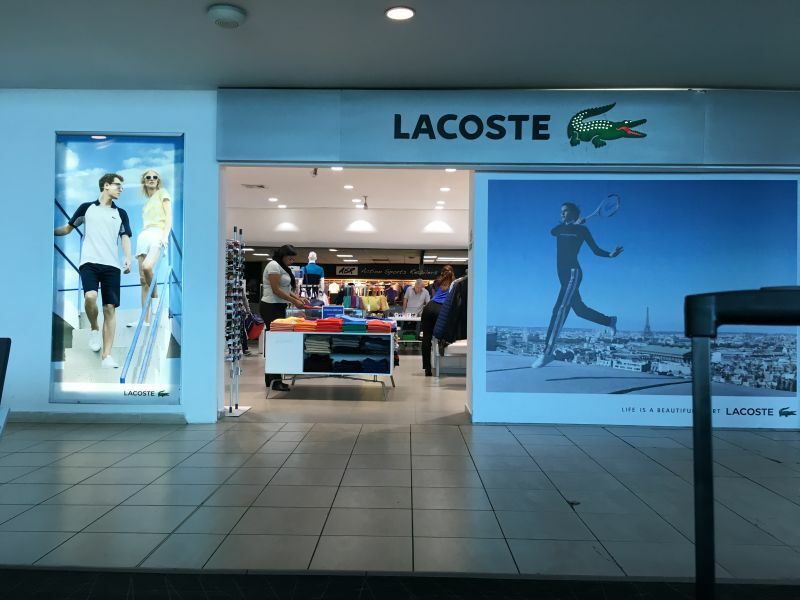 The Lacoste store there had some nice shirts that I did not see in the US market. 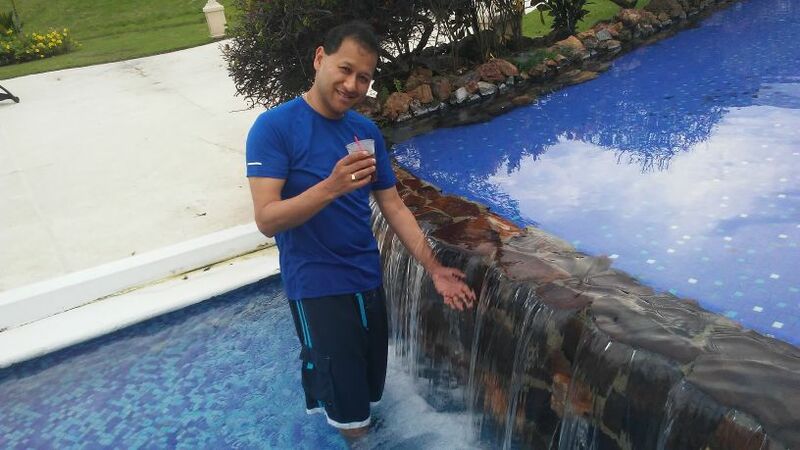 I went to visit Panama during Memorial Day weekend in 2017 with Joy. 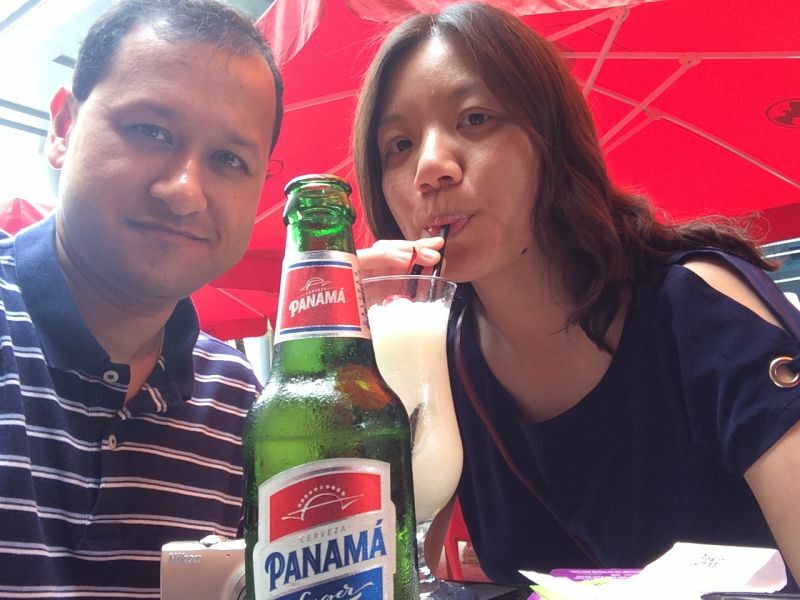 We were searching for a cool place to visit for that long weekend, and we saw that Panama was a direct flight away from SFO. As a result, I booked our tickets on COPA Airlines, which is the national airline of Panama. Our seven hour flight out of SFO was on a Boeing 737-800 which was kind of surprising since it is a relatively smaller aircraft for travelling that kind of distance. 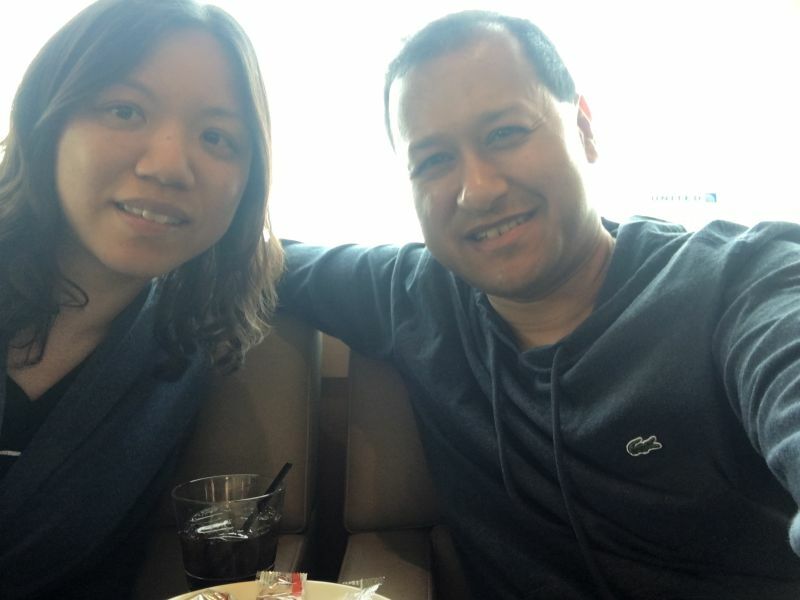 After arriving at the international terminal at SFO, we chilled at the United Club before it was time to board our aircraft. This United Club at SFO was not as good as other United Clubs that I had been to, but they were renovating and building a new Polaris lounge too. 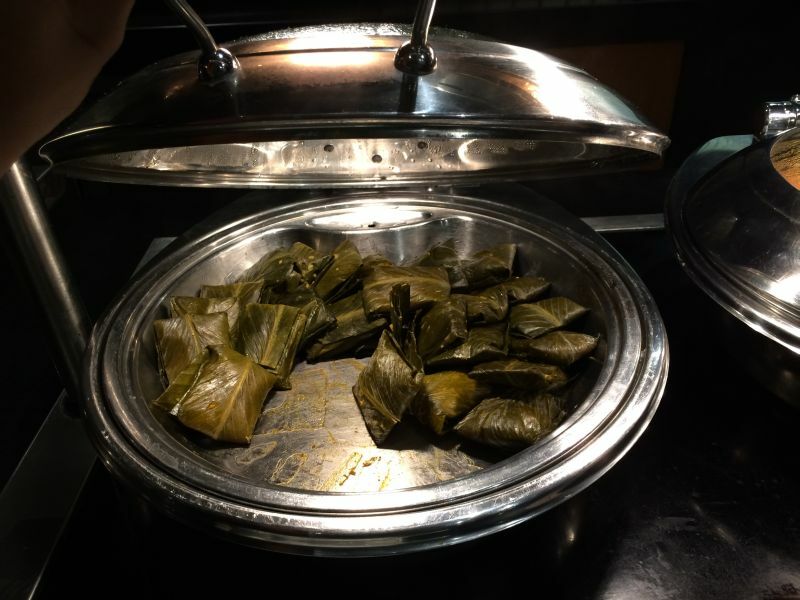 After a few drinks and some snacks in the United Club, we took off for Panama on our red eye flight. They did serve us dinner after we took off. Before landing in Panama, I could see the ships all lined up to go into the Panama Canal. We arrived around 6:00 AM so the sun was just coming out. We had a private airport transfer service greet us in the baggage claim area after we cleared customs. 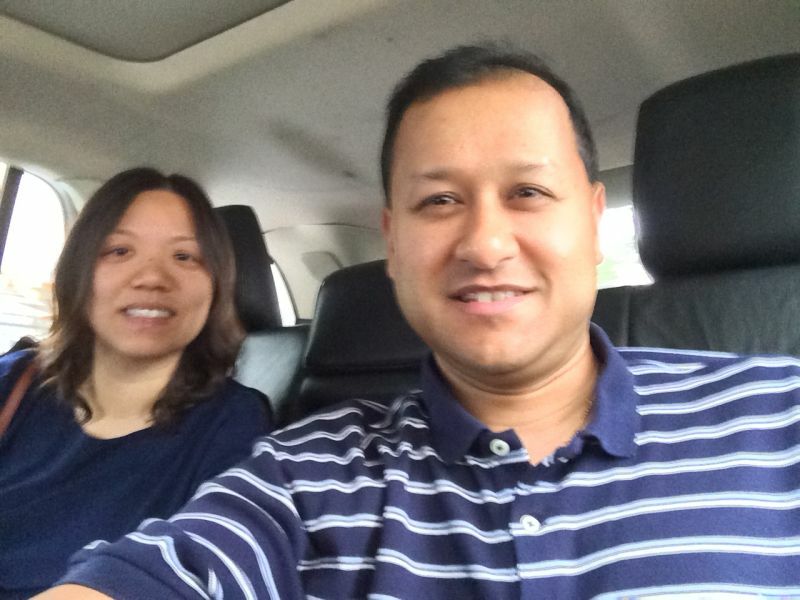 The driver then took us to the Waldorf Astoria Panama City. 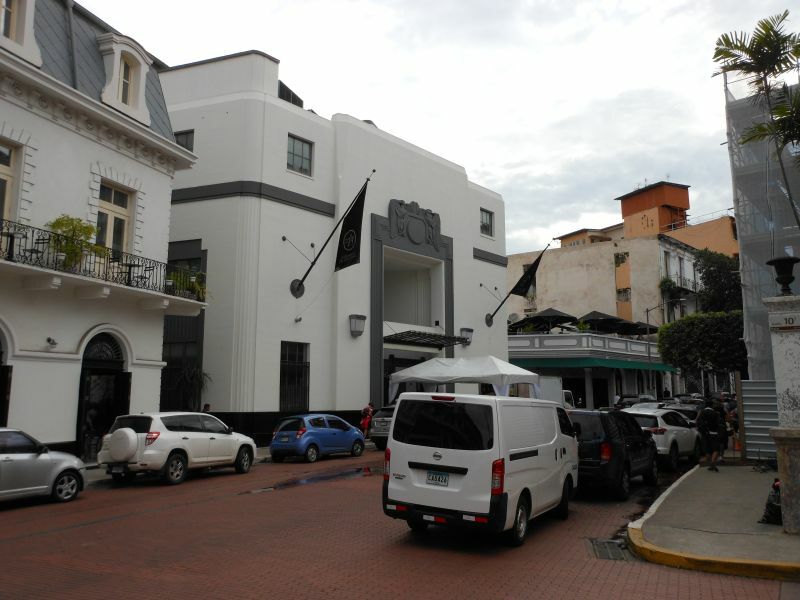 This was the only Waldorf Astoria property in Latin America. 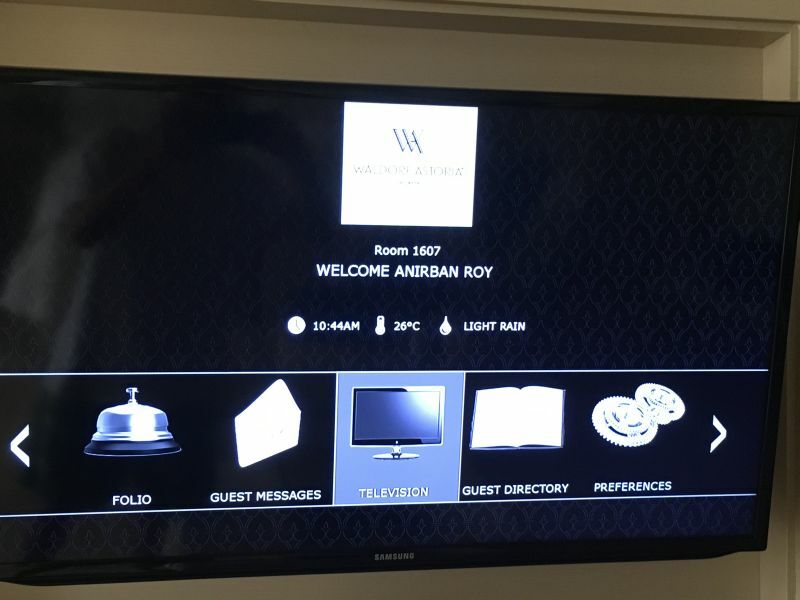 Upon arrival, they greeted me as a HHonors Diamond member. 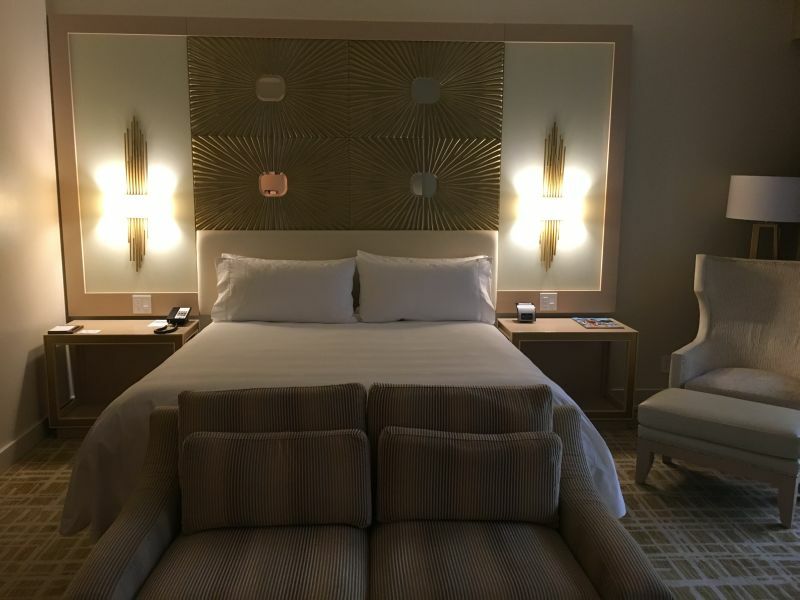 They upgraded us to a junior suite, and we also had $35 in dining credits. Although Panama's offical currency is called the Balboa, they do not print any Balboa notes. They have some coins like a 1 Balboa coin as well as a few cent coins which are the same size as the US coins of similiar value. The Balboa is equal to $1 US. They use US bills however for their currency primarly. As a result, there is no need to exchange money at the airport. Our suite was not yet ready so the front desk guy said we could go enjoy the buffet breakfast in the restaurant, and he would have a porter take the key up to us. So, we enjoyed a great breakfast that included made to order omlettes. Our suite was available about an hour after we got to the hotel so we were able to get some sleep before we wanted to head out and do some siteseeing. The junior suite was a little small, but it was decent. 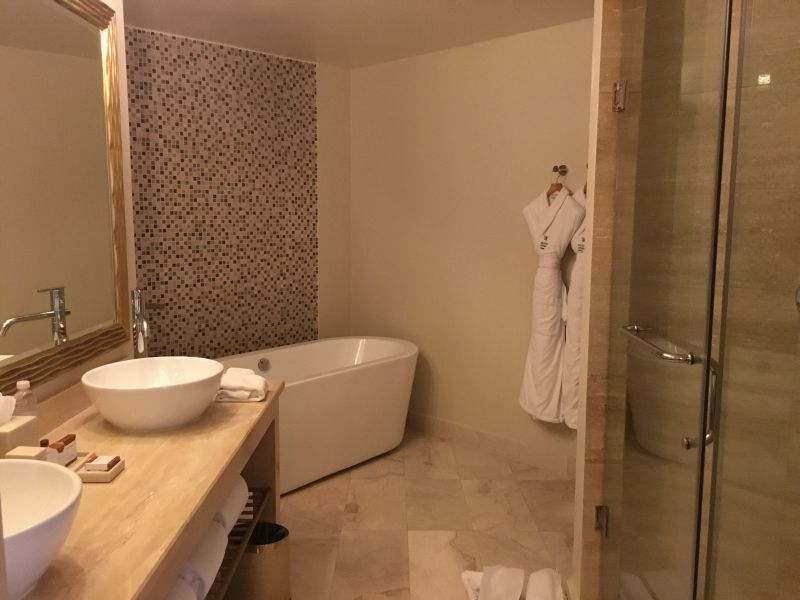 There was a nice soaking tub as well as a rain shower. Moreover, the sheets were really nice. I am very picky when it comes to sheets. The Waldorf Astoria had a Lincoln Town Car as their house car that took hotel guests within a few kilometers of the hotel. The car dropped us off at the Multicentro Mall which is where the Hop On, Hop Off Bus Tour departs from. After checking in with our vouchers, we went to a sports pub called Red Lion to have some drinks before taking off on the tour. The waitresses were really cute! They had one Hooter Girl type outfits too. The double decker open top bus departed around 1:00, and we got to see a lot of the beautiful skycrapers as we were making our way through Panama City. 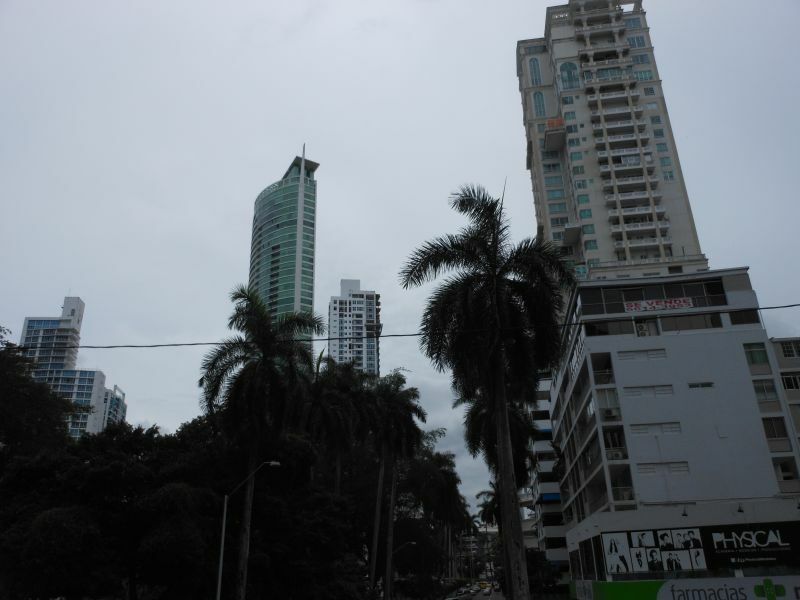 Panama City has the third most skyscrapers in the Americas after only New York and Chicago. 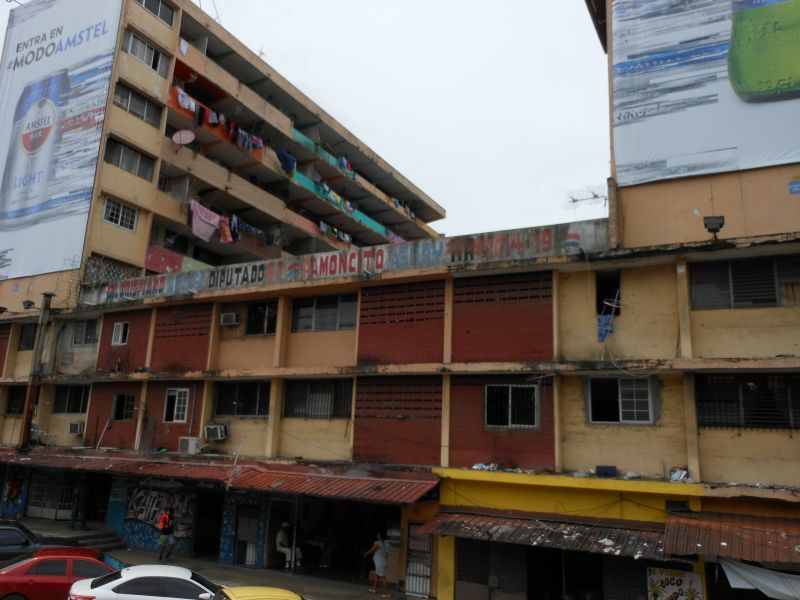 We went to the Albrook area too which was part of the US Canal Zone when the canal was under US control. There is a large mall there as well as a domestic airport. 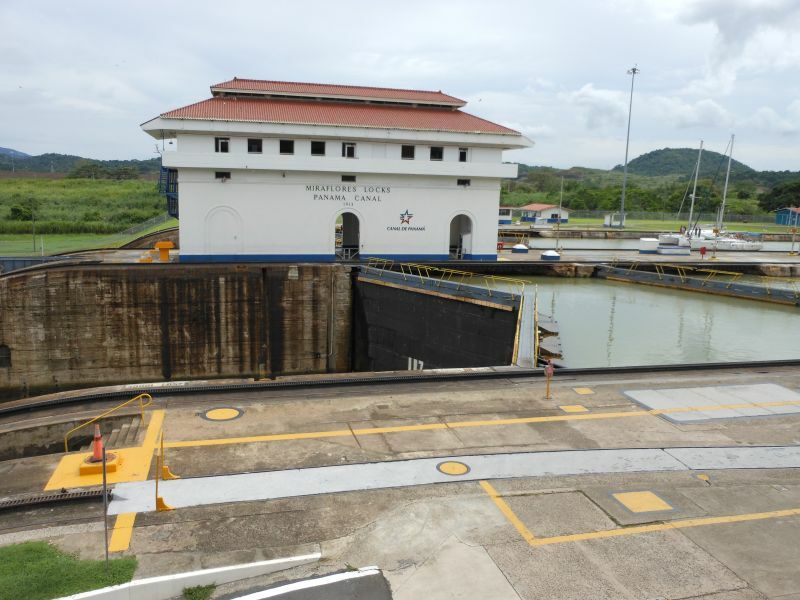 Afterwards, we got to the Miraflores Locks of the Panama Canal where they have a large visitor's center. We got to learn about the building of the canal there as well as see the locks up close. 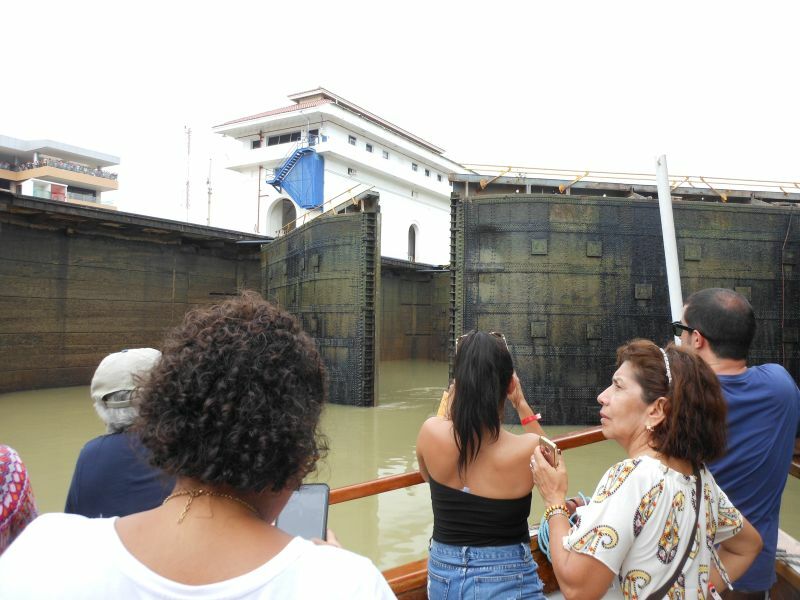 The Miraflores Locks have two locks which take ships up from the Pacific sea level to the lake level or down from the lake level to the sea level. 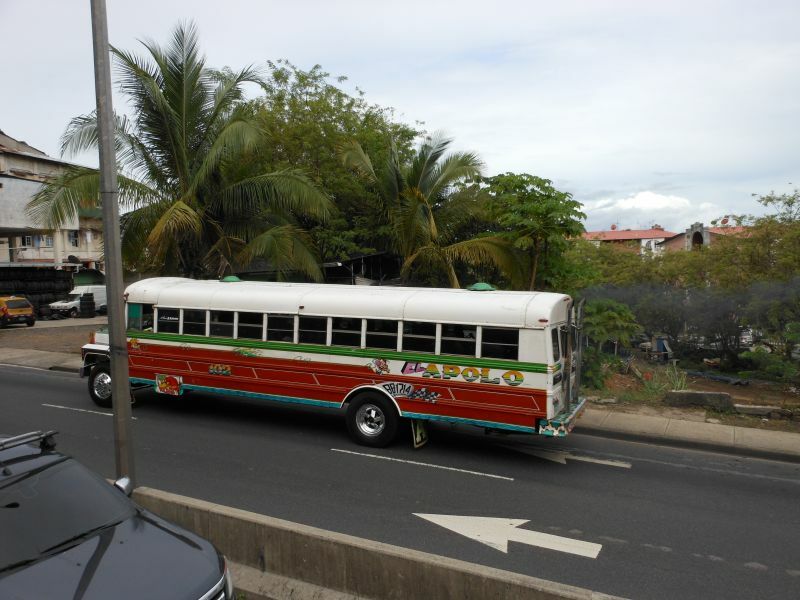 Our next stop on the bus tour was Casa Antigua which is the old town, but the bus took us through some ghetto areas first as well as the Amador Causeway which was really cool. They used the rock from the digging of the canal to build a land bridge connecting three off shore islands. This land bridge helped the US guard the entrance to the canal with cannons, but it also allows for a natural barrier for ships. We got off the bus at Casa Antigua, and we walked to a small restaurant for a late lunch. Ceviche is the national dish of Panama so we indulged in some. 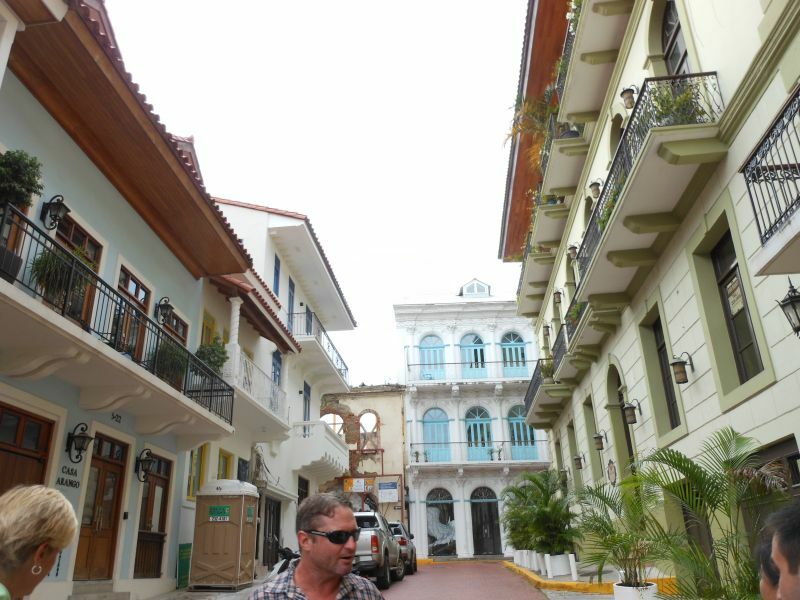 Then, we walked over to the American Trade Hotel in Casa Antigua, which is where our Taste of Panama City Tour began. Our guide was American, and our first tasting was the "geisha coffee" which is the world's most expensive coffee bean. It originated in Ethiopia, but they grow it in Panama now. These beans go for $200 a pound. We had a $8 cup of this coffee which was not even half of a cup. In Tokyo, this cup goes for $50. 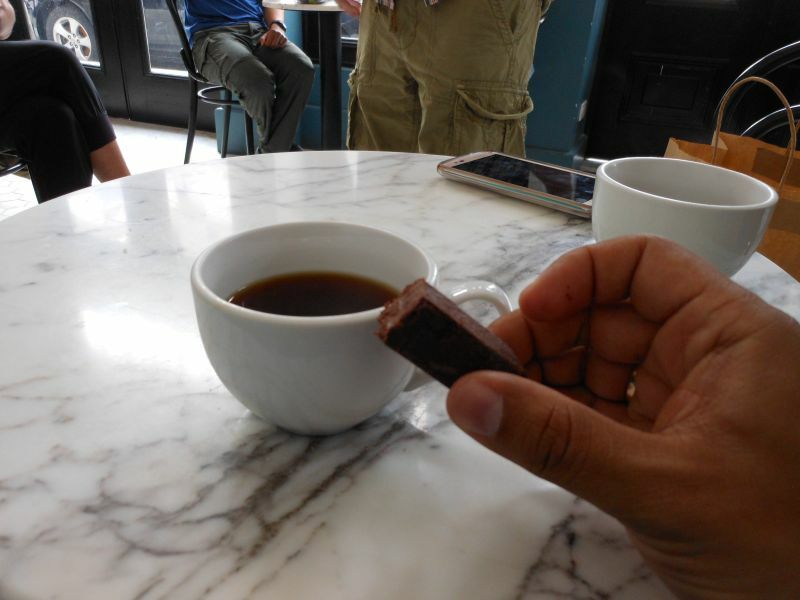 We also had some amazing organic Panamanian chocolate to go with it. While on the tour, we met a cool couple around our age from California too. After the coffee tasting, we walked around Casa Antigua looking at the historic buildings in this UNESCO protected part of town. 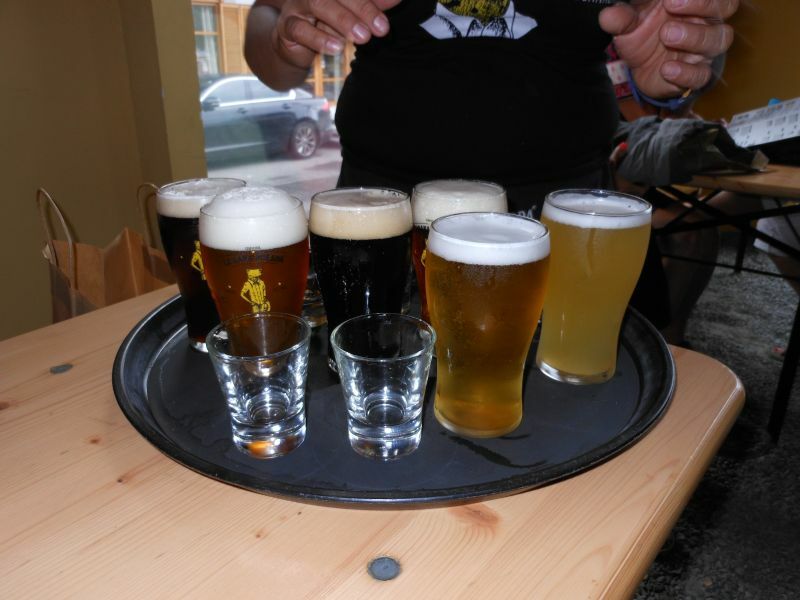 The next stop on the tasting tour was a brewery. This brewery was named after the famous yellow frog in Panama. After trying some beer, a second guide took us on a walk around a really cool causeway built over water to the famous seafood market. The seafood market was made famous by Anthony Bourdain who visited it when he was filming in Panama City. We had some more ceviche at the seafood market. Afterwards, we went to the roof top bar at Tantalo. 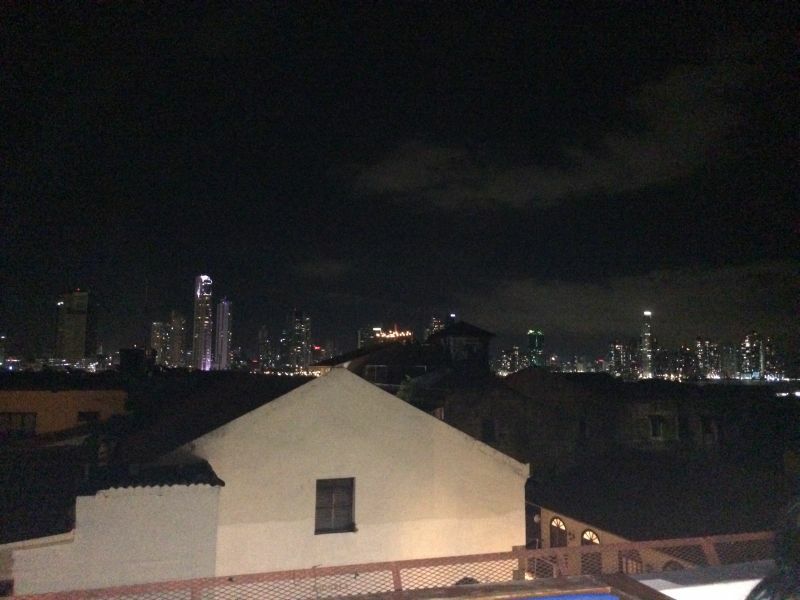 The views of Panama City at night were amazing from this roof top bar. They had DJ music too. We tasted 7 year rum here made by Ron Abuelo which is owned by the current president of Panama. After the rum tasting, our tour ended. Joy and I hung out with the couple from California. 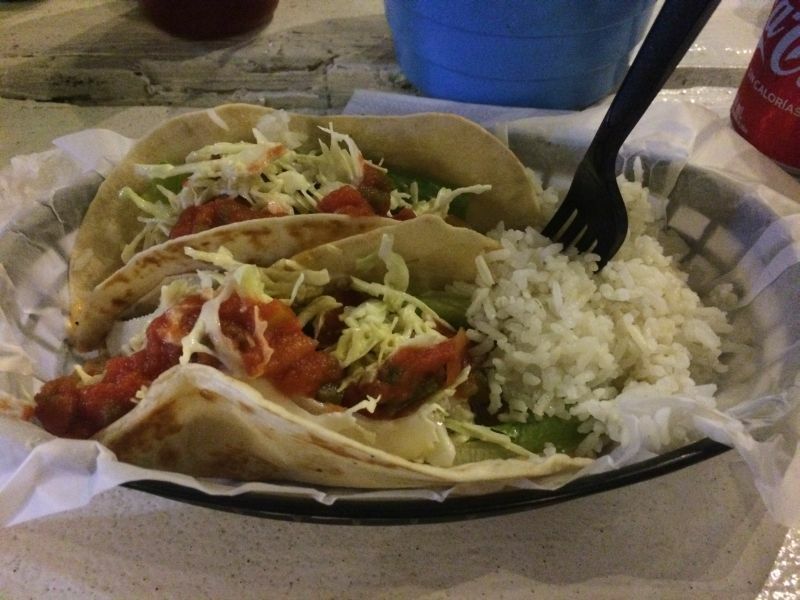 We went over to an awesome fish taco restaurant in Casa Antigua. It was outdoor inside of the ruins of one building. The tacos had tuna in them. We also went to a cool rum bar after dinner. The next morning, we enjoyed the pool at the Waldorf Astoria before a car service took us over to the Dreams Delight Playa Bonita resort. 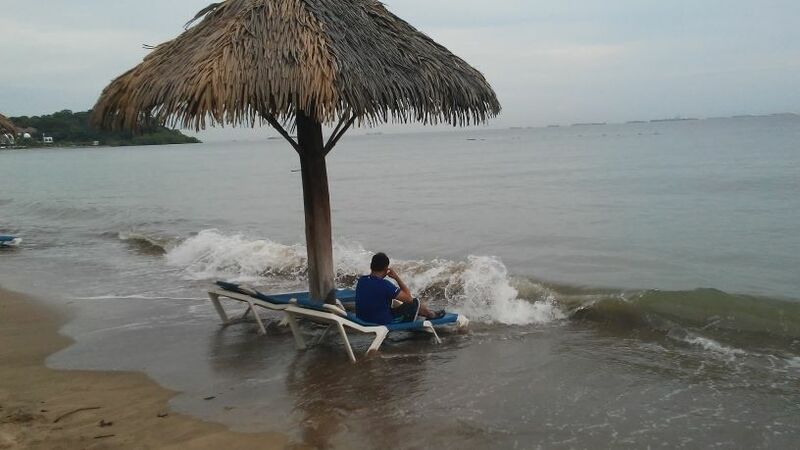 This is an all inclusive beach resort near Panama City. 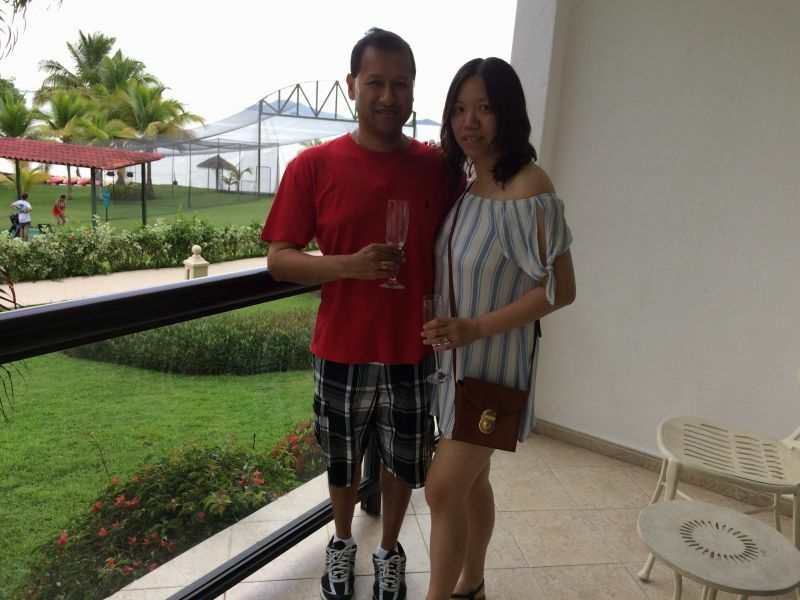 They greeted us with champagne as we checked in to our partial ocean view room. Afterwards, I just hit the pool and took advantage of the all inclusive liquor. LOL. We had two dinner options that night too. The seafood place was just average so we went to the Panamanian buffet too. That was a little better. 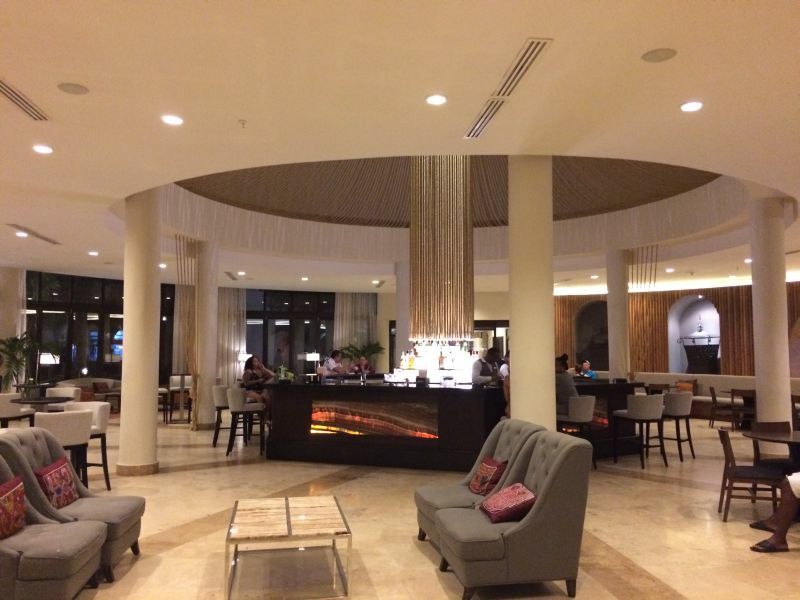 In the lobby bar, we were able to take in some live Panamanian music and drink more rum. I really liked that Ron Abuelo Anejo rum. The resort had a club too that was open until 1:00 AM with liquor too. 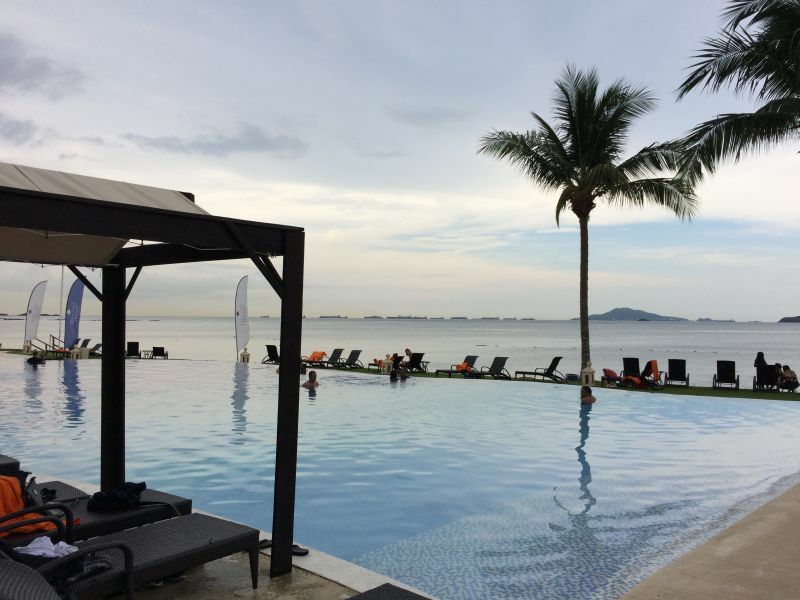 The next day, we had the breakfast buffet before chilling at the pool some more. 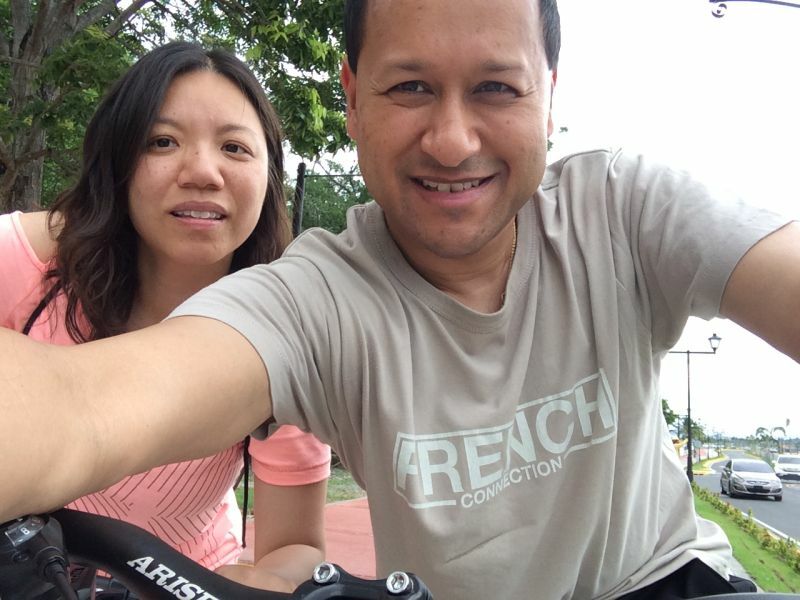 In the afternoon, we rented bikes and went around the Amador Causeway area. 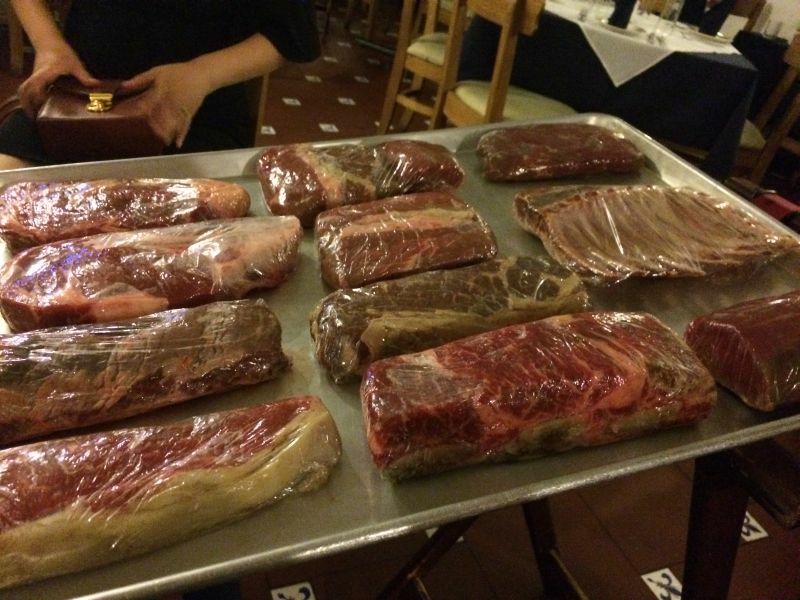 The concierge at the Waldorf Astoria recommended an Argentine steakhouse called Gaucho's Steak House for dinner so we went there that night. The steak was really good! The flan was also amazing! After dinner, Joy and I got a drink at Hooter's. We had our partial transit tour on the Panama Canal the next morning. 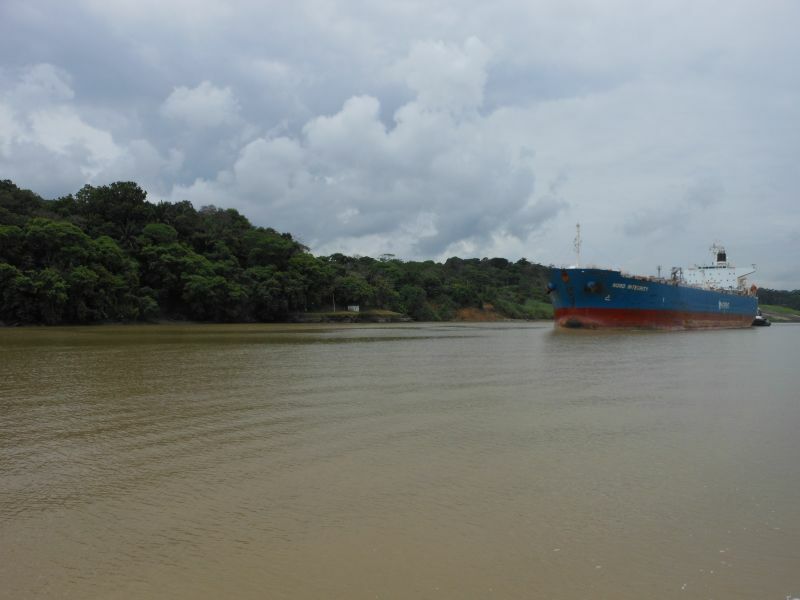 They picked us up at the hotel and drove us to the port of Gamboa which is about half way through the Panama Canal near Lake Gatun. From there, we boarded a boat that was over a hundred years old and called Islamorada. This boat took us through the Culebra Cut which is where they had to cut through a lot of rock and hills to build the canal. 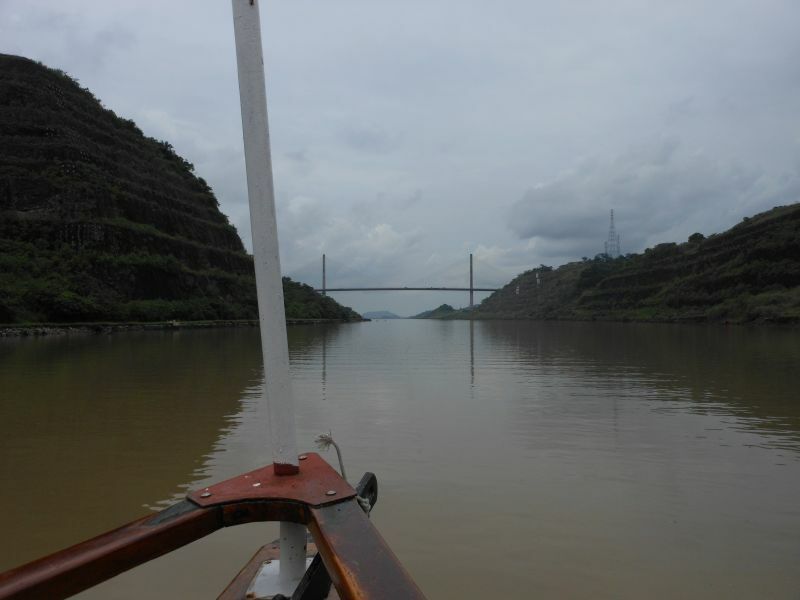 We saw the Centennial Bridge before entering the Pedro Miguel Locks. This was the first lock en route to the Pacific. It was so cool to experience the locks first hand like this. There was a large ship behind us that travelled with us too. The tolls for large ships can be as high as $1,000,000. The water was let out of the lock so we could descend to the level of the Miraflores Lake. On board, we were served a great buffet. 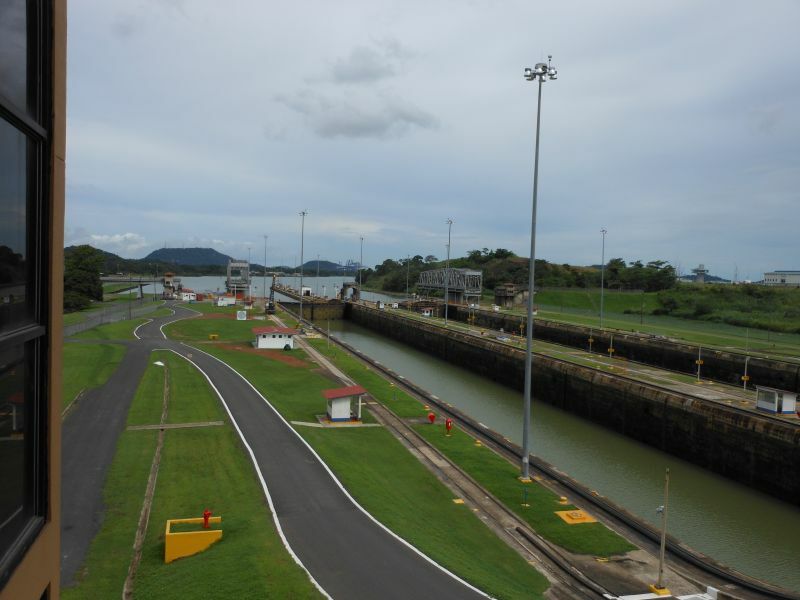 We went through two other sets of locks at the Miraflores Locks. This took us down to sea level. This was a really cool trip! 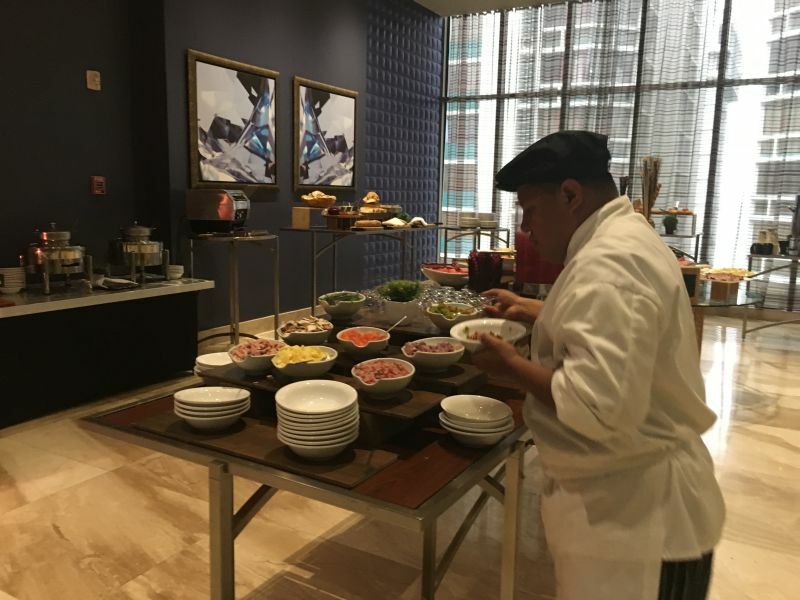 I have been to Costa Rica and Belize too in Central America, but Panama had a little of everything including beaches, rain forests, high rise buildings, good nightlife, and awesome food.